What’s life without at least one bicycle touring per year? With the ‘beast from the east’ making frequent visits to the British Isles the east coast of North America was the safe bet for some stable and warm weather over Easter holidays. Florida lost out due to the flight cost and Cancun won. The connecting flight from Chicago to Cancun was full of teenage spring break travellers – all very happy (read loud and noisy). 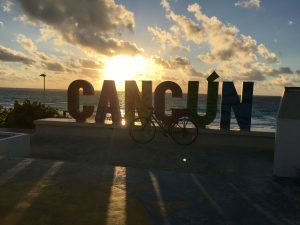 I had to ditch the idea of taking my bicycle due to some practical reasons and instead decided to hire a bicycle from Cancun. 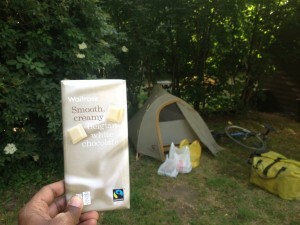 Given that the average temperature was 25 plus (degree Celcius) through out my time warm gear was unnecessary and even the rain gear was redundant – a light weight luxurious bike touring with no tent, nor sleeping bag. I had originally planned to cycle to Palenque ( 1200km) over 10 days. This would have been a hectic ride in the scorching sun instead a more chilled Mayan Meanders ensued. I had done no research on this area prior to my arrival and assumed Cancun was just a beach destination. I was quite wrong. This peninsula had lot more to offer. 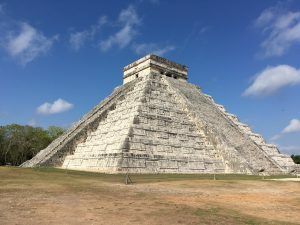 If anything, the signposts on the highway was a clear indication of the diverse attractions on offer: jungle resorts, beaches, theme parks, Cenotes and of course the numerous Mayan ruins. 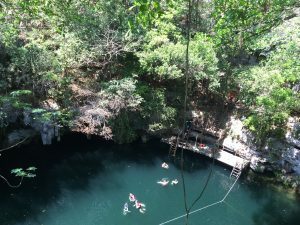 Cenote is the name given for a natural hole in the ground, like a sinkhole. This region had numerous Cenotes resulting from the collapse of limestone bedrock. The water in the Cenotes offer an excellent place to cool down and some fabulous chilling out. 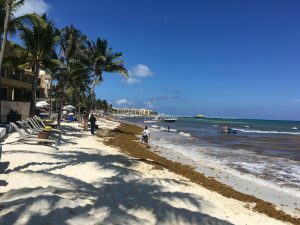 On the first day I left at 6am when it was still dark and took a detour to visit the Zona Hoteleria just outside Cancun – a narrow strip of land in the sea full of hotels. It was a coincidence that I arrived at one of the famous beaches for sun rise! 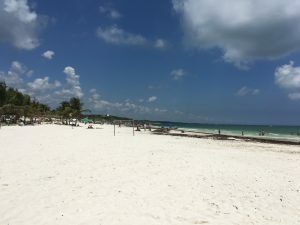 With just one coffee and a yoghurt from Starbucks I made it to playa del Carmen in just under 4 hours arriving at 10am. This place was heaving with tourists after all the beach was just 2 mins walk from the town centre. 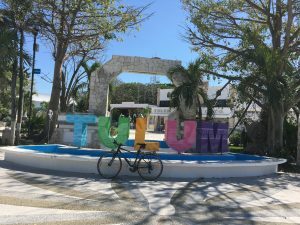 The second day of ride was to Tulum, just 61 kilometres away – an early morning two hours ride. 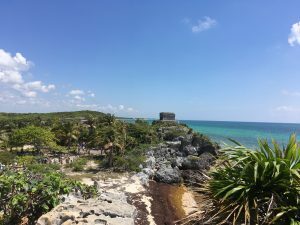 At Tulum I went to see the ruins and decided to do some snorkelling which was on the list of things to do but I never had the courage. It was an adventure worth it. The water was warm the various shades of bluish green water was fabulous. Nevertheless, I lost the breathing tube within the first five minutes and panic set in. My guide and his assistant couldn’t hide their amusement but was kind enough to throw a rubber tube into the water which I held on to for the next 30 minutes. I dipped my head in every time my guide pointed out a turtle or some lovely coral reef. Next time when some one mentions snorkelling I know what it means. 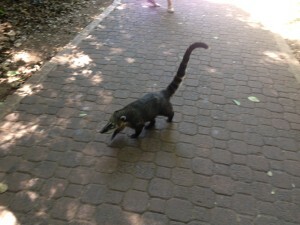 From Tulum I went inland, another two hours early morning ride to Coba just 47 kilometres away. 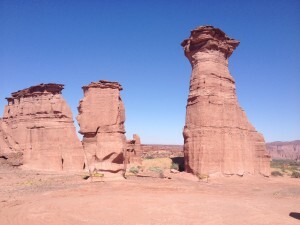 Tourists get bussed in to this ruins and early mornings are the best to beat the crowd. Cyclists think alike. I met a german cyclist at the entrance of this park who had cycled in from opposite direction. 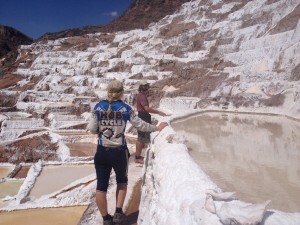 This site was quite big and a private company rented out bicycles for use within the park. Outside bicycles were not allowed. I tried my best but they wouldn’t budge. So we both decided to take a walk. 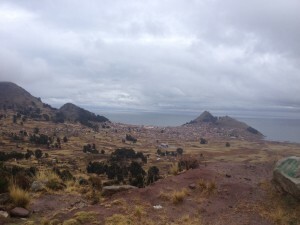 This site had a massive and steep pyramid where people were allowed to climb up. The view of the jungle from the top of the pyramid was excellent. This pyramid must have been quite a task to build without cranes. The site of ruins was in a wooded area making the walk a pleasant one. 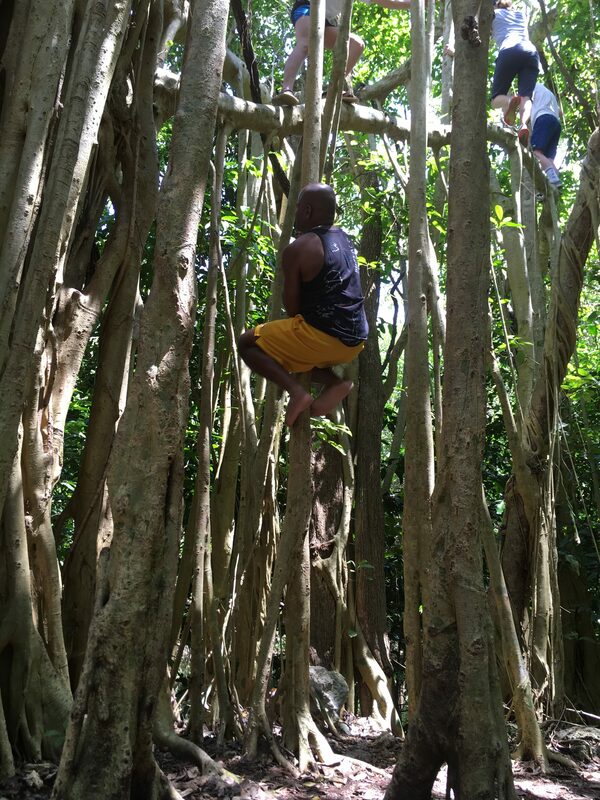 We met a family of four from Utah who decided to climb one of the banyan trees. 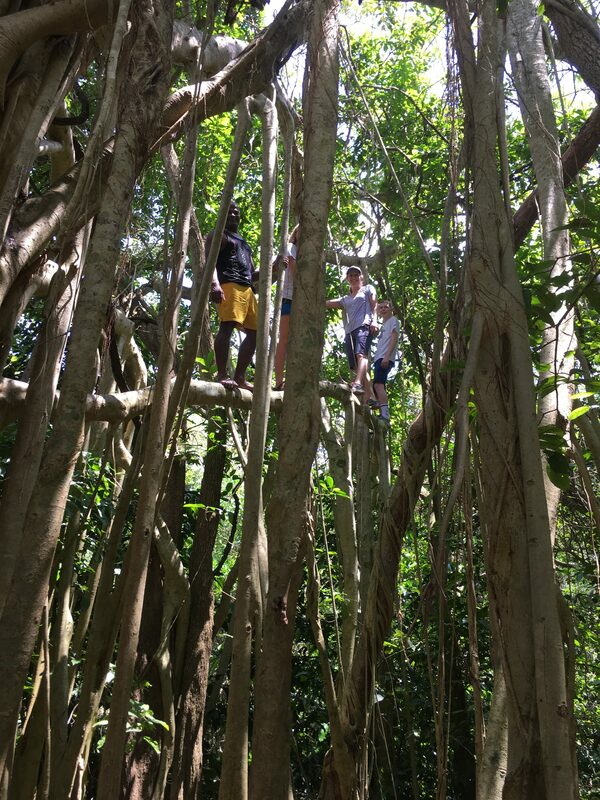 The kids were astonished to see the aerial roots. It was fun to scale this tree in the ‘traditional’ manner. It turned out the parents were also Chemistry teachers. 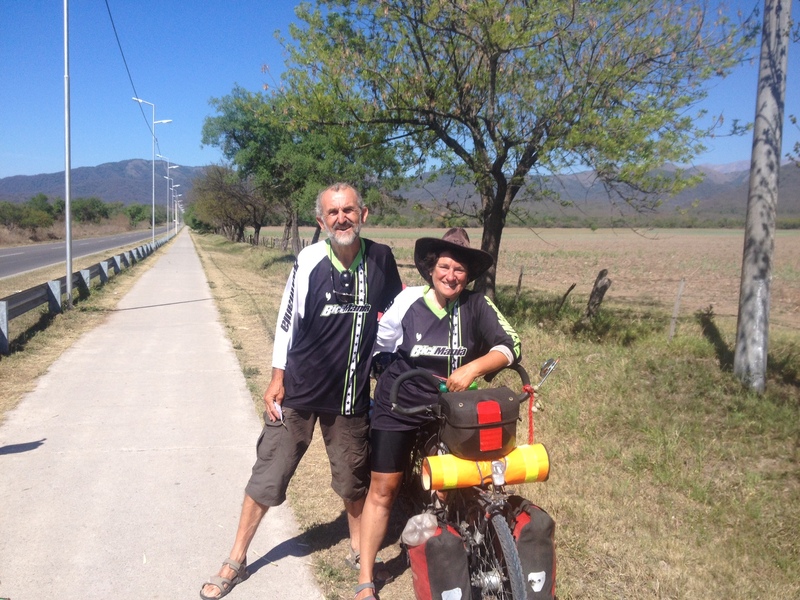 Next stop was Valladolid which was the nearest city to the famous Chichen Itza ruins. I was at the ruins at 8am the next day to avoid both tourists and the heat. 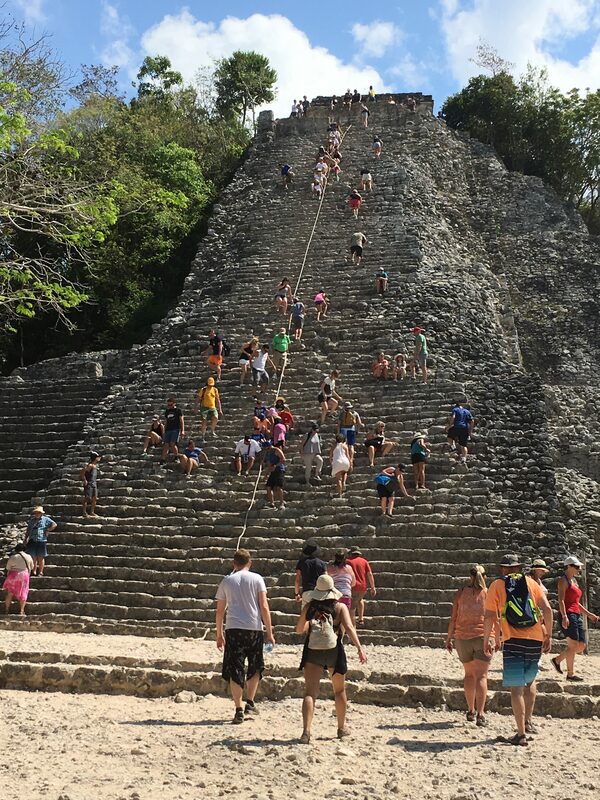 There were plenty of structures standing intact from the Mayan time but unfortunately the pyramid was off limits for climbing. These structures were grand. 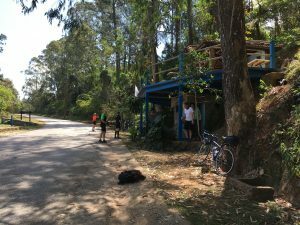 After visiting the ruins, as planned, I arrived at the Cenote Yokdzonot which was recommended to me by the guys at the bicycle shop. I went into the water without much fear this time since life jackets were compulsory and also this felt safer than an open ocean. 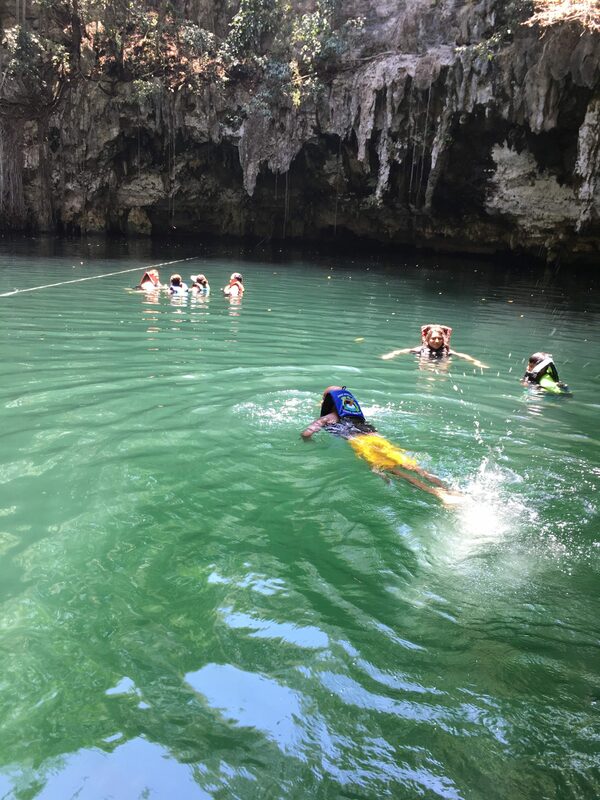 The water was crystal clear and cooler with some beautiful limestone rock formations. Because I stayed there overnight I had the privilege of going into the water once again after lunch. Life felt good in the water there. From the Cenote another early morning long ride took me to Merida, about 102 km – the longest ride of this trip. From Merida I took the bus back to Cancun where this trip ended. life is safe with a life jacket! 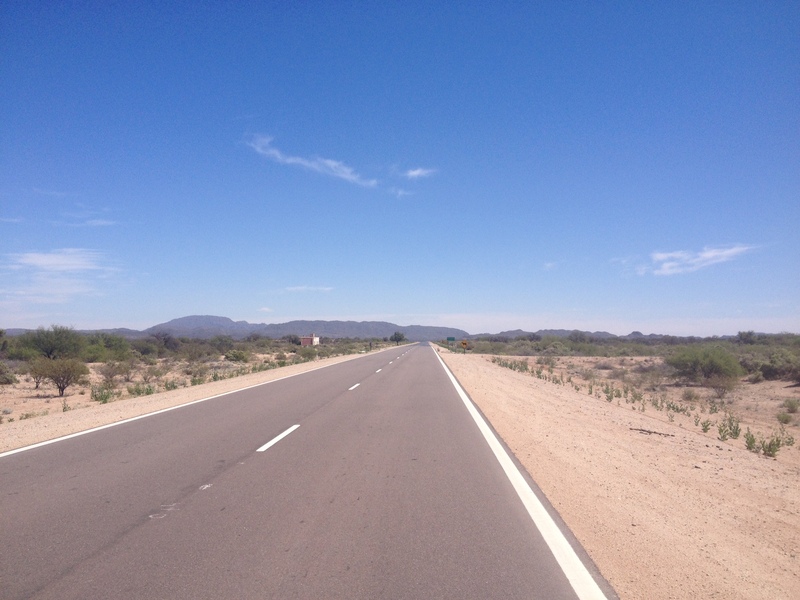 Route: Cancun – Playa del Carmen (90 kms) – Tulum (61) – Coba (47) – Valladolid (63) – Yodzkonot (68) – Merida (102). For those who wish to rent a bicycle I highly recommend the bicycle shop ‘Elite Cyclery’ at Cancun who had a wide range of bikes of all sizes and types available for rent (Disclaimer – I was not paid to write this!). 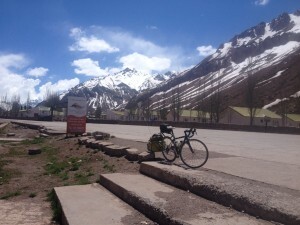 After a brief period of lull it was time to revive the cycle touring spirit albeit with a short tour, a very short one, compared to the previous journey. The criteria to select the place was warm weather and a place where I have never been. Cuba met this criteria and more – this country is well known among cycle tourists for its traffic free roads. Off I went packing my bicycle; this time a trailer was not needed just a small daypack that sat on my shoulders was sufficient. 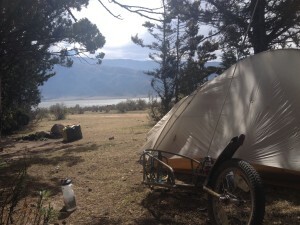 My original plan was to ride for about 10 days in total plus two days on either side to just chill. On arrival in Varadero airport I got picked up by the taxi to Matanzas where I assembled my bike and left the bicycle bag in the casa where I stayed at. 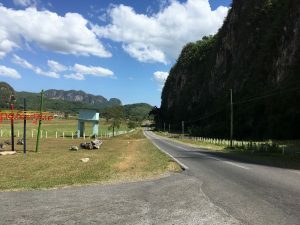 The roads were traffic free and wide and the terrain I rode was generally flat, no major hills or mountains, for most part of the route, except near Trinidad. 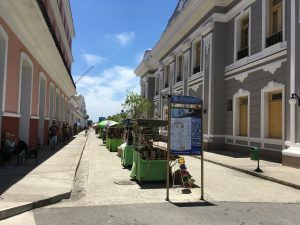 The first day I covered 80 kms to Colon and then second day was 120 kms to Santa Clara from where I headed to the coastal town, Trinidad which was very popular among tourists for its colonial architecture. From here I rode to Cienfuegos along the coast. After about 20 kms the highway was covered with thousands of dead crabs. 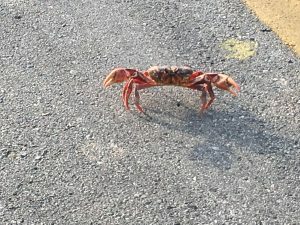 I had no idea why these pitiful creatures would crawl to the tarmac from the beach sand only to be get killed by the traffic. To ride over these dead crabs for several kilometres was sick. But I had no choice but to just pedal as fast as I could to get away from this crab-disaster zone. 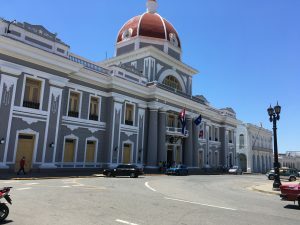 After four days of cycling, on arrival in Cienfuegos, I decided to cut short the cycling for it was unbearable to cycle at 30 plus degrees centigrade. 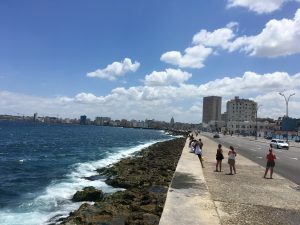 From here, I took a bus to Havana where I dropped most of my stuff and left for another 3 days of riding towards Vinales. With no bag on my shoulders, but just the small bag on the seat post rack, the ride was more enjoyable and I took the route which was not frequented by tourists. These three days brought back some pleasant memories from my previous cycling trip and how much I missed it. 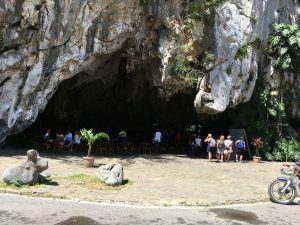 Vinales was a region that was very popular among tourists because of the hills. 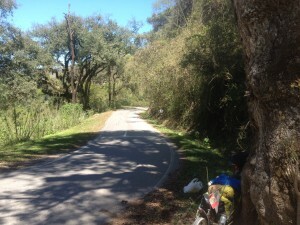 It was much better than other parts of Cuba in terms of the vegetation, lot more trees and a bit hilly terrain. 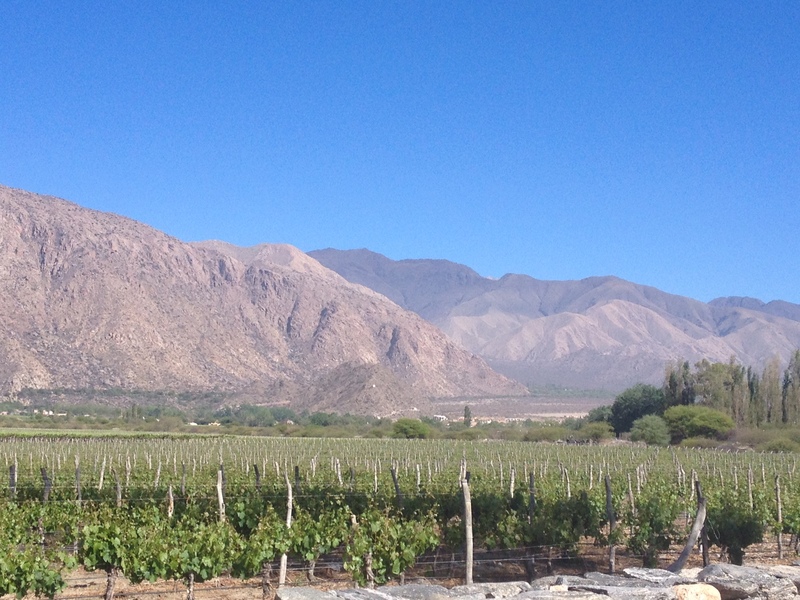 However, I was not terribly impressed perhaps because I was comparing it to the Andes mountains. In my infinite wisdom I had forgot to restock my puncture repair kit which was missing the puncture repair solution. I was hoping to get a new one in Cuba. First lesson learnt was that it is hard to find things in Cuba, yes, even a decent bicycle puncture repair solution. Perhaps, the numerous horse drawn carts and bicycles in Cuba never gets punctured. The high street in towns and cities were not typical – the absence of marketing bill boards, sale, offers, discounts was conspicuous. A bottle of cold drink was often hard to find, either they did not have the right size or it was not cold. When available the cost was almost the same as in a corner shop in London. The trick was to rely on things that were local. Freshly squeezed sugar cane, mango or guava juice was just dirt cheap. Although, the quality of the water used to make them could be dubious. A thirsty cyclist may not give a damn about this but only later to run to a pharmacy to get some ciprofloxacin. Alas, that’s when he might discover that foreigners were not allowed to use the same pharmacy shops, or at least the same counters. They may need the same medicine but the administrators believe in extracting a high price from the tourists. I was offered ciprofloxacin for 15.5 USD. Fortunately, I knew a trick or two. I cycled away from the tourist town to a smaller village where, my skin colour and Spanish skills got me a whopping discount of 99%. I paid just 16 cents, (4 pesos in local currency). In tourists towns, foreigners were kept separate, almost. Foreigners were only allowed to use a designated bus company to get around which locals were not allowed to board. It was illegal to host foreigners which meant no couchsurfing or warmshowers. And worse, Cubans were required to obtain a special license even if they wished to host their best friends or families from overseas in their houses. The hospitality industry was heavily restricted. Hotels were rare however there were plenty of ‘casas’ – bed and breakfast equivalent. The owners of these were required to get a special permit for which the government extracted a heavy price (in USD) from them in the name of license and the price for accommodation was 20-25 USD per night per person. Throughout the island, except in the capital where it was 35, the cost was standard. The cost of internet was the next shock. People don’t have internet access at homes, let alone mobile internet. Tourists, and even the locals, had to buy a special card in the designed offices in town centres at certain times. It was USD 1.50 per hour. The internet access was through wifi at designated parks and plazas. It was quite a sight to see all those internet obsessed people in one location – the plazas and the parks which would have been places for socialising! The lack of internet at homes meant booking accommodation in advance were almost impossible. Often, it was done by word of mouth and phone calls. Whenever I arrived in a city/town I would see the sign for a ‘casa’ and even if they were full they would always take me to their relative or friend who had a place to stay. Finding accommodation was not that hard but the standard price was quite annoying. Even in remote villages it costed the same and these casas were eager to make dinner and breakfast for an additional cost, charged in USD. Meanwhile, food at the high street was dirt cheap even though it was just very basic, meat and rice plus onions and tomatoes that constituted salad in the local dictionary. Havana was a lot different to most of the island and even here there was not much traffic. It was a joy to ride the wide streets with little or no stress. However, the administrators central planning was conspicuous. 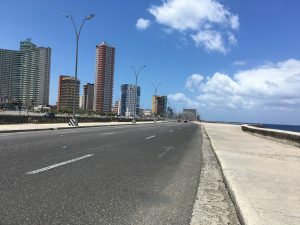 The road next to the sea, malecon, had six lanes and fast moving cars but bicylces and motor cars were not allowed – pity it would have been such a nice ride. The administrators grand design is also notable by the dilapidated high tower blocks next to the sea. Elsewhere, this part of the city would be buzzing with lot more life. However, the sea breeze and the warmth made it a beautiful combination to walk along this promenade at night times. 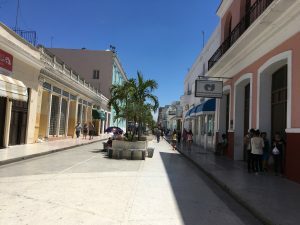 Cuba was lot different to most places, perhaps one of the key attractions for most tourists and the traffic free roads were fantastic for some non-stop, traffic-lights free, road cycling. Che’s catchy phrase ‘hasta la victoria siempre’ is omnipresent along the highways although I was a bit unsure if the victory had arrived for the ordinary Cubans! Buenos Aires was hot all day and every day and it was a perfect place for a bit of chilling, reminiscing and future planning. This time was also used to catch up with some of my friends and also to organise a job and a place to live in London on my return. 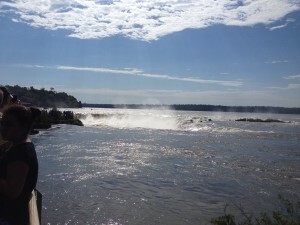 There was one more thing to do before my return: Iguazu falls. 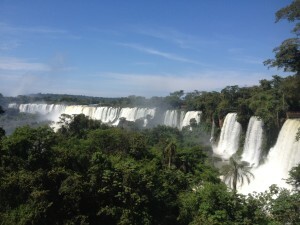 The bus from Buenos Aires to Puerto Iguazu was about 17 hours but was comfortable enough. 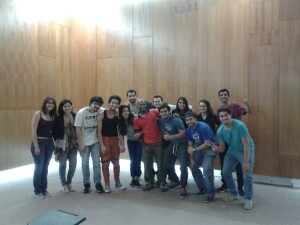 I spent a full day each on the Argentinian and Brazilian side. This falls was beyond anything I have seen in the past. The river looked calm and tranquil. However, when it dropped over the 80 metres cliff, the roar and thunder was majestic. 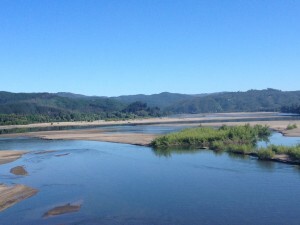 The river spreads itself out over 1.2 kms before dropping over the cliff. 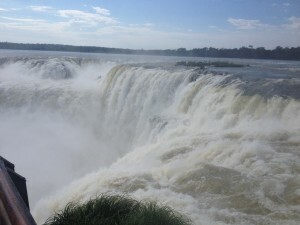 The wall of water was a spectacular site. 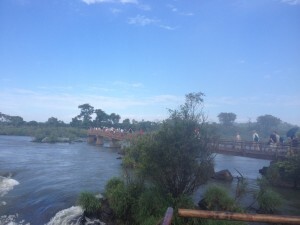 Visitors were taken closer to the falls by the walk ways that were constructed over some parts of the river and also some sections went right on top of the falls. 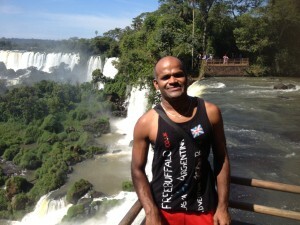 It was an amazing experience to watch some of the water falls from standing on top of it. Also a short boat ride at touristy price was worth it since it gave the view of the falls from the front and on top of it the boat drivers went right up close to the falls to make it worth. With the weather at 30 plus degree C no one complained about getting wet here. A long wall of water! To transport both bike and the trailer back to London would be complicated. Luckily an eager Argentinian guy bought the trailer off from me. 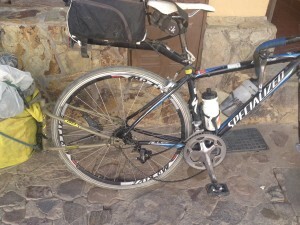 Specialized road bike was a reliable partner for the whole trip in spite of being 7 years old so I was not willing to sell it. However, to transport it back the airline wanted about 200 Euros about half the price of the ticket itself. I hatched a plan to beat the airlines by its own rules. The bicycle was broken into its barebones and the frame fitted the size of the bag that was permitted by the airline as regular luggage. Fantastic. Although, the wheels had to be bagged separately I was allowed to carry two bags and yet i was well within my weight limit. Overall I managed to fly the bicycle back to London from Rio de Janeiro at no extra cost although it took a lot of planning and shopping around for decent bags. The ones I found were not the typical ones seen on baggage carousels in the airports. In addition it did not have wheels, the awkward size bag was best carried on top of my head like a coolie in India during ancient times. 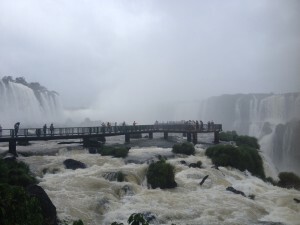 This caught the attention of several people during transfers in Iguazu and in the city of London, but it is for them to judge and for me to ignore. 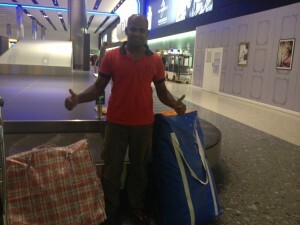 Me and my bicycle returned to London safely. It is hard to believe what had happened in the last 21 months, feels like a blink of an eye and I am still struggling to get over the fact that it’s over. Time is the best healer. Adventure spirit never goes away though perhaps some microadventures over school holidays are most likely for the time being. With regards to dreams I really want to get my book written-up! The end was in sight and the countdown began. 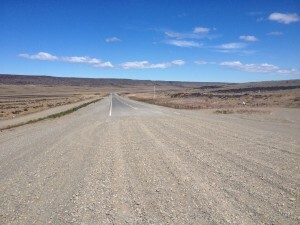 After El Calafate the next bigger place was Puerto Natales in Chile and there was a 70 km ripio (Spanish for gravel roads) section in between. 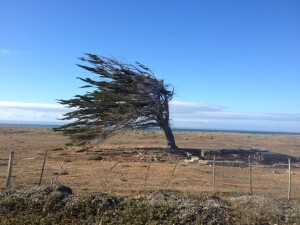 I took the 75 km detour to avoid this even though it meant some potential headwinds when heading west from Esperanza. Early mornings were generally better for winds and also on that particular day it was calm. I timed it well to avoid the headwinds. On the fourth day, after leaving El Calafate, the road towards Puerto Natales had some beautiful views of Torres del Paine, some stunning granite rocks standing tall. I was quite close but did not go into this park because I did not have the time nor the gear to do some proper mountaineering; perhaps another trip sometime in the future. Puerto Natales to Punta Arenas was 240 kms away and I pedalled it over two long days. Technically, Punta Arenas, as most Chileans pointed out to me, was the last big city at the southern end of this continent. Ushuaia which boasted the title of ‘End of the World’ was located on an island, called Tierra del Fuego shared by both, Argentina and Chile. 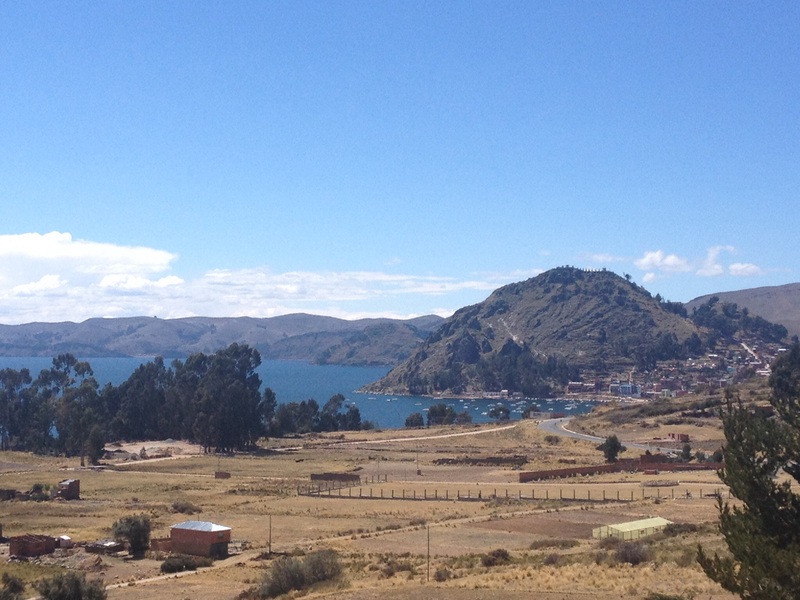 It was a two hour ferry ride to get to this island from Punta Arenas. 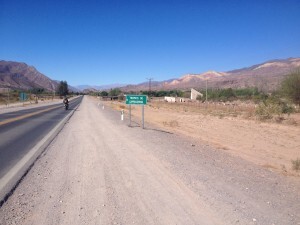 On arrival at Porvenir, the first small town in this island, a long stretch of approximately 156 kilometres of gravel roads waited for me. 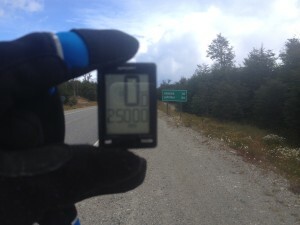 I had to ride this section in order to cross another milestone in this trip, twenty five thousand kilometres. It was just for statistical purposes but why not. Apart from the small estancias (sort of farm houses) there was nothing along this road, just a dry land mass with tons of wind. The more south I got the winds got stronger and stronger. Luckily on this stretch the winds were tailwinds and on the day I chose the gusts were 78 kmph. If it wasn’t for the gravel roads this would have been a piece of cake. The winds threw me around all over the road but generally kept me moving forward. The road surface was not too bad though; a well compacted gravel road except for the last 20 kms closer to the border. I was riding with full warm gear, full pants, beanie underneath my helmet, full gloves, thick socks and a jacket. This was not quite how I imagined this would be. The blustery winds generally did not let the temperature rise during the day. A lonely wind battered tree along the route described who was the boss on this island. 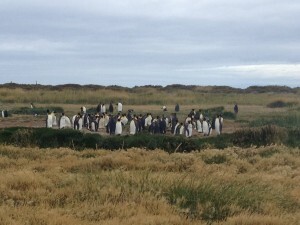 A ‘bunch’ of emperor penguins have migrated to this island some years ago helping to put this place on the tourist map. It was a 12kms detour, one way, and that too on gravel roads. I stored my bicycle in the bus shelter at the junction and hitchhiked to see them. It was not as impressive as I expected though perhaps because of vthe David Attenborough’s documentaries featured these birds on some stunning islands in Antarctica and so this visit was just a tick in the box for me. After crossing the border at San Sebastián the roads were asphalt once again. 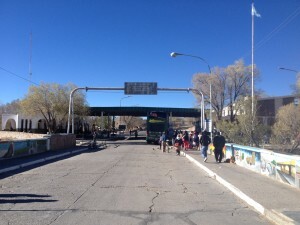 I covered the distance of 78 kms to the city called Rio Grande in just under three hours. I felt invincible but once arriving in the city the road direction changed putting me directly in front of the winds which battered me and put me in my place. 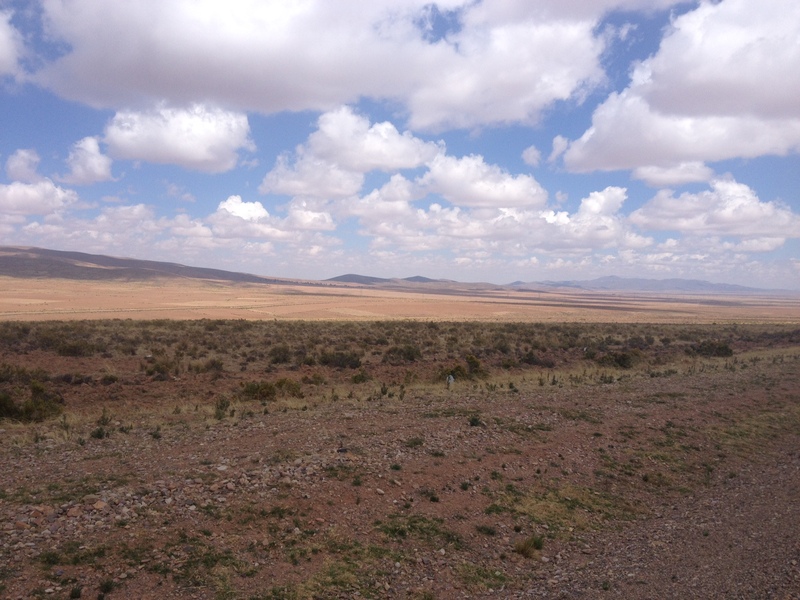 After about 50 km from Rio Grande the pampa landscape gave way to some rolling hills and closer towards Tolhuin the landscape took a big change, it was more alpine. However the temperature here stayed in single digit (degrees Celcius) throughout the day. Combine this with the windchill it was barely above freezing temperature and not quite pleasant for someone who prefers tropical climates. 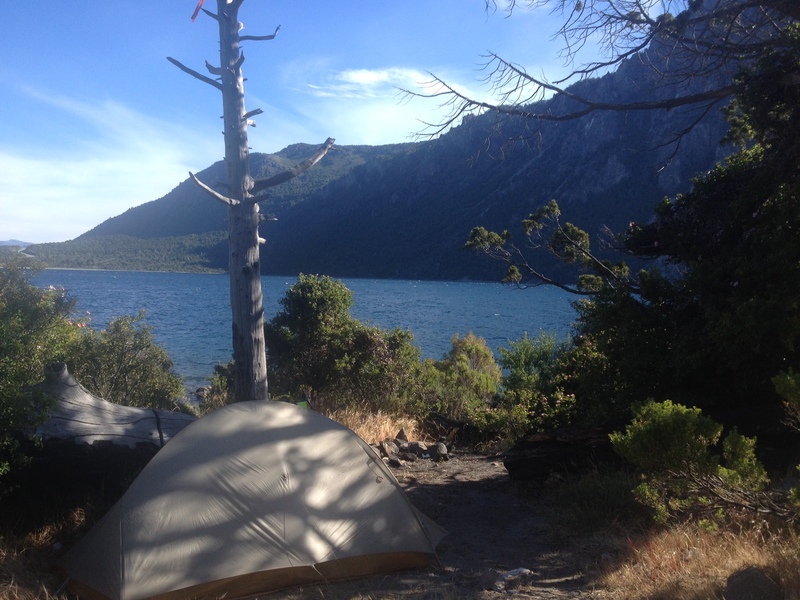 The British summer looked a lot more tropical compared to the summer in Tierra del Fuego. From Tolhuin it was 104 km to Ushuaia but I dragged the end a bit and rode this over two days since accommodation in Ushuaia was way outside my budget. 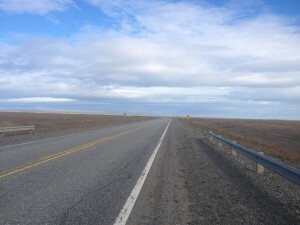 During the last two weeks I was asked by several people whom I met along the route including some cyclists who asked about how I felt about the end that was coming. It only hit me on the penultimate day when I emptied the fuel bottle. There were no more roads to continue south and I started feeling the void; something that kept me busy was gone. It was a bit sad to see the bicycle boxed and being loaded on to the plane in Ushuaia. When the escalator moved the bike box from the luggage trolley and on to the plane’s belly I felt a beast was caged the one that rolled 25,090 km over two continents (After thought: this sentence might sound dramatic but it was exactly how I felt at the time). At the Ushuaia airport waiting room while I was watching this scene unfold, scenes of my life over the last 20 months were playing in my head, a bit of a smile with puffed eyelids at the same time; the sense of success with a tinge of sadness was a bit overwhelming. The little boy, who grew up in one of the slums of Chennai, only dreamt of a better life at his younger age. 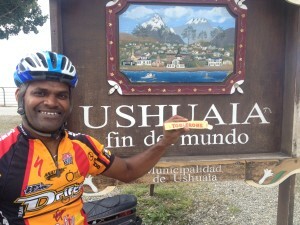 Little he knew that Alaska and Ushuaia would beckon him later in his life and that too on a bicycle. The last 20 months and two weeks could not be described simple as bicycle touring, it was something bigger. It was a dream one that was conceived about three years before the start of this journey. The motivations to embark on this journey were several. I wish to write this up and the events that led to this decision in the form of a book since I believe this story will be of interest to some. The enthusiasm from the pupils in the schools and the students at several universities that I spoke to during this trip confirm this. I am very grateful for life and the opportunities it presented to experience and realise some of my dreams. The dreams that I had when I was young were radically different to the ones that I conceived later in my life. I chose to free myself from the illusion of stability in life, a career, a place to own etc., and seized the freedom to purse some of my dreams that would make me happy. A happiness born from the self without depending on the recognition of others. This unashamedly self indulgent journey was worth taking the risk. Apart from the obvious effects, this trip has freed my mind and has left me with ideas for more adventures in life and I have no doubt that some of the effects of this trip will be latent. When the mind was free life seemed beautiful and the happiness was permanent. Everything about freedom has been said and there are plenty to quote from. I will chose one that might be a bit obscure but quite pertinent. I watched a documentary once, during my time in South Africa, whose title I forgot (shame on me) but left a strong impact on me. A lesbian woman of colour who was imprisoned during apartheid for some offence and later was working for a NGO at the time of making of the documentary said ‘freedom is in your head’. She felt a lot more ‘free’ inside the prison cell than outside it. 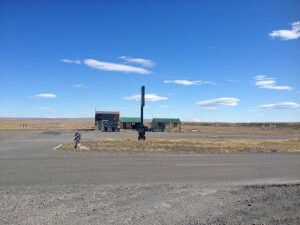 El Calafate to Ushuaia (1065 km; the route): El Calafate – El Cerrito (96) – Esperanza (70) – Tapi Aike (81) – Puerto Natales (112) – Villa Tehuelches (147) – Punta Arenas (100) – an Estancia via Porvenir (75) – San Sebastián (91) – Rio Grande (78) – Tolhuin (107) – Lago Escondido (53) – Ushuaia (55). 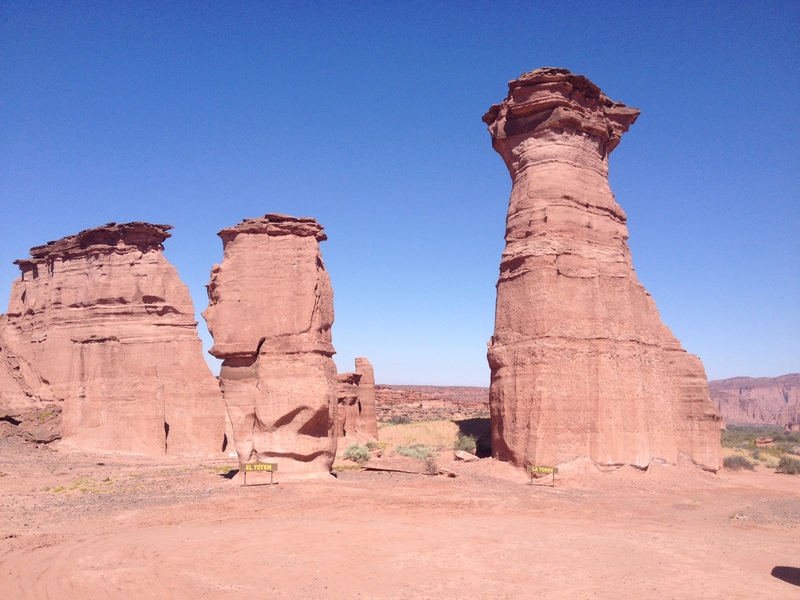 Patagonia region spans over two countries, Argentina and Chile, and were quite distinct. There were several gravel road sections which my road bike tyres didn’t like and this on its own provided for some adventure. After Bariloche, the theme of lakes and mountains continued for about two days until El Bolson after which I had to detour to avoid some gravel roads. 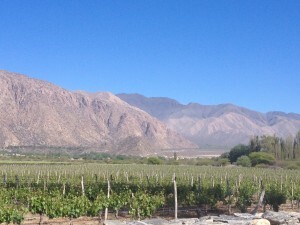 Just some 30 kms away from the mountains, towards east, the landscape was totally different, pampas as it was called; dry landscape with not much water and nothing else for that matter, arid and barren. 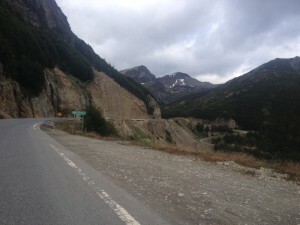 Carretera Austral in Chilean Patagonia, an infamous region for cycle touring can’t be missed but several sections of gravel roads posed a problem. I pored over some cycling blogs and figured out which sections were paved. From Esquel in Argentina a bus ride took me over to Futaleufu, the border town in Chile where I rode the 10 km paved road. This town was nested in a valley surrounded by high mountains and a beautiful river well known among rafters for the forty or so grade 4/5 rapids. 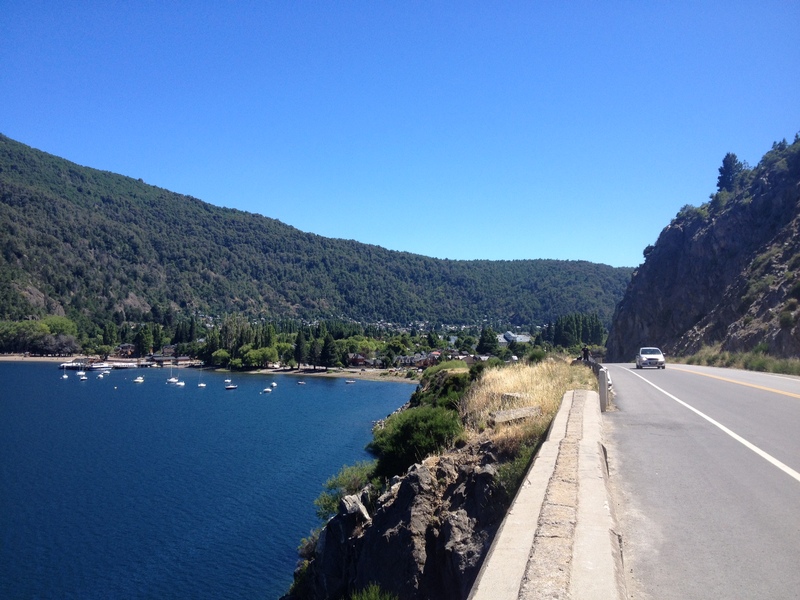 Another bus ride from Futaleufu took me over the 60 kms or so gravel roads to join the Carratera Austral at Villa Santa Lucia where 30 kms pavement began. I rode that and waited at the end of it to hitch a ride to escape the next 30 kms gravel to La Junta where I camped out next to a river just on the side of the road. 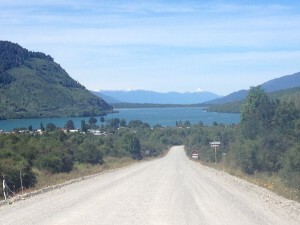 La Junta to Puyuhuapi was 47 kms including a 17 kms gravel section which was sort of rideable. 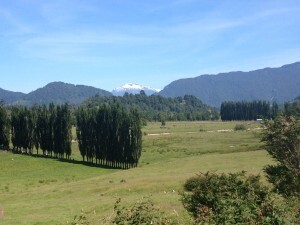 From Puyuhuapi there was another 60 kms gravel road which I ditched. After this it was all paved. 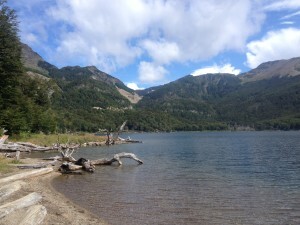 Two more days of riding took me to the city of Coyhaique. 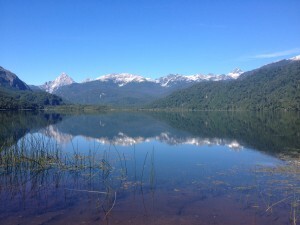 Carretera Austral was characterised by lush vegetation, glacial melt waters gushing out of the mountains, forming water falls and rivers that fed several lakes and was scantily populated too, an excellent rural setting. The crystal clear water in the lakes, that reflected the mountains around it, tasted divine. Camping opportunities were plenty. Of the more than 1000 kms or so of this road I only rode the northern half for the second half was fully gravel; at least I had a glimpse of this paradise. 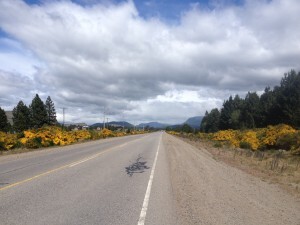 The villages along this route received vegetables once in a week and I was not able to find tomatoes, apart from this tomato crisis, I did not find riding in Carretera Austral an adventure, perhaps in the past it might have been as some cycling blogs report. In fact I found it lot more relaxing. The nature was pristine and unspoilt. I would like to return here someday and would probably add some rafting, cayaking and glacier walking to make it more adventurous. I spent four nights in Coyhaique to make use of the excellent campsite and the friendly atmosphere. The supermarket in this town even had chocolates from Waitrose, a supermarket chain from the UK known for its quality products; I was full of smiles. On top of this they even had basmati rice which is very hard to find in South America, except Chile. I stocked up two kilo grams of this for the next ten days. After a day of hard cycling basmati rice with some vegetable curry felt like a treat, especially in the Argentinian Patagonia. After Coyhaique, two days of riding, all on asphalt, took me over to Puerto Ibanez where a ferry crossing to Chile Chico, the border town, was due. 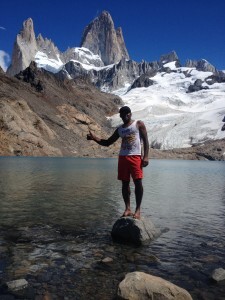 From Chile Chico I crossed back into Argentina. I found Chile, in general, was lot more organised and developed. I would say almost first world, at least compared to the other countries in this continent. 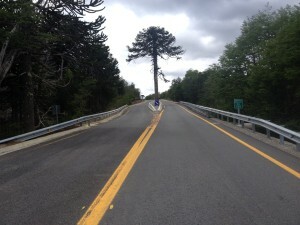 Riding in Argentinian Patagonia can be a challenge as I was going to find out. In shark contrast to the Chilean side, the landscape here was dry water was hard to find and long sections, hundreds of kilometres, of nothingness. 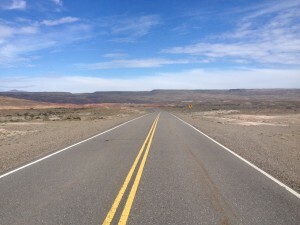 Indeed the major challenge here was the Patagonian winds known for its brutality, at times, headwinds, tailwinds and crosswinds; I had it all and of varying intensity. 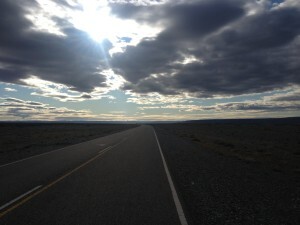 Except for a seventy kilometres section the roads were paved all the way from Chile Chico to El Calafate. After a 130 kms ride from Perito Moreno I arrived in a small village called Bajo Caracoles where there was a police station, health centre, petrol station, a hotel and one kiosk. In total 15 people lived here, I was told. I needed bread for the next two days but the kiosk won’t sell me bread but only homemade sandwiches which costed 60 pesos just two bread slices with some cheese in between (3GBP or 4.5USD approximately Patagonian price they say). I explained to the lady that I eat an awful lot of bread for breakfast and 20 GBP for breakfast was beyond my budget, I would rather stay hungry. She took some pity and asked me to come back at 9pm when she sneaked some bread for me through the kitchen window, the left over bread after making sandwiches for the following day. There was more than half-a-kilogram of bread and I walked back to my tent with big smiles for having staved off the forthcoming bread crisis. When there is a will there is a way. Having learnt the lesson, when I arrived in Gobernador Gregores after two days, I bought two kilo grams of pan Frances (baguette) for the next 3 days. I was not prepared to take chances, besides the Argentinian Baguette was super good, I loved eating it with dulce de leche (caramel) and that too an awful lot of it every morning which gave me decent energy for most of the ride every day. 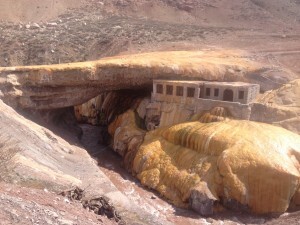 After leaving Bajo Carocoles for about 108 kms there were no water sources, at least the previous day there were some small streams where water would trickle down enough to supply a handwash basin. Also, I was going to find out the different between headwinds and tailwinds on the same day, I was riding at an average of 13 against 30 kmph respectively. It was a long straight road for about 50 kms where I fought the headwinds for straight 5 hours after which came the sharp turn and tailwinds. Make some distances while tailwinds prevail. 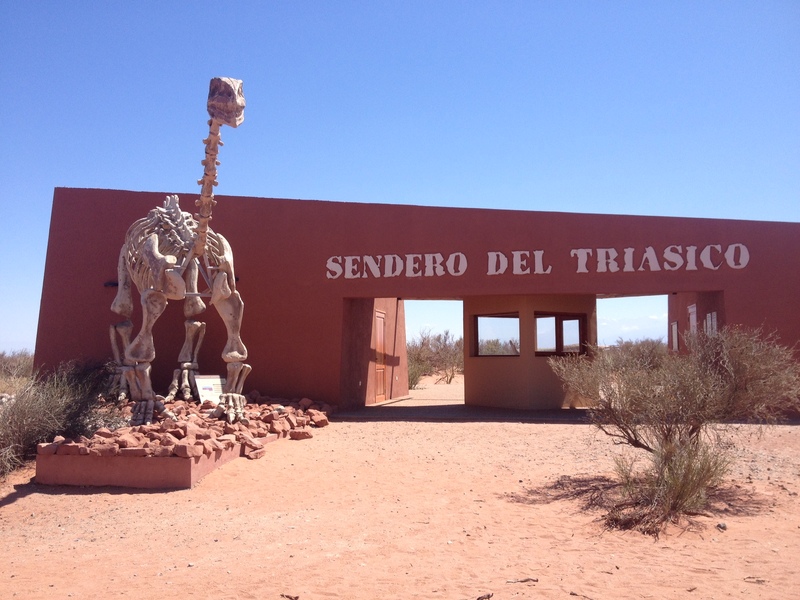 I rode an extra 30 kms and stopped at Estancia Sylvina ( a farmhouse in the middle of nowhere), instead of the previously planned destination. 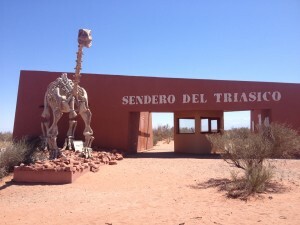 I did not know what was in the water at this estancia, the next day I rode 91 kms in two hours and fifty minutes to arrive in Gobernador Gregores, a record that won’t be possible again without the same tailwinds. On leaving Gobernador Gregores, after 60 kms, at the junction with Lago Cardiel to be precise, was the 70 kms gravel road section. I was mulling over whether to ride or hitch. When I arrived at the junction the first 20 kms where quite compact and rideable dirt so I continued. However 70 kms of dirt road/gravel road on one day would be torturous if not unpleasant. So after 20 kms into the dirt road I stopped at the only estancia called La Serbia for the night. The next day was quite hard on the saddle. The final 30 kms of this unpaved section was gravel with big stones and I had to walk at times. 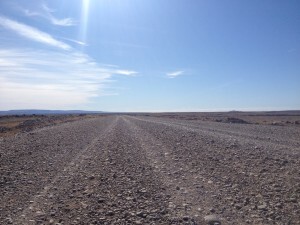 It took about 6 hours of grinding through the gravel to navigate the remaining 50 kilometres of this unpaved road although the rest of the roads were all paved. 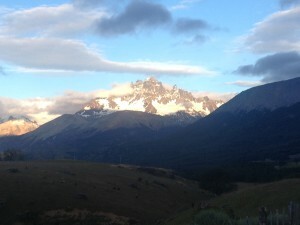 In Argentinian Patagonia the the views did not change for long distances but there was a certain beauty to it. Whilst the Chilean Patagonian section, Carretera Austral, was teeming with cyclists only handful of them travelled over on this side. 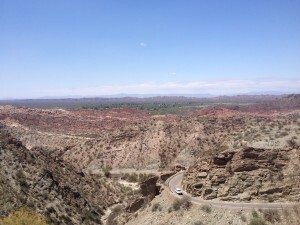 Many site the lack of visual stimulation, barren and arid landscape as reasons but I found the shear thrill of riding through some of the challenging routes compensate more than enough. The open skies, vastness, expansive views and no distractions provided an excellent opportunity to reflect on the journey, i.e life, and happiness arose from within, one that does not depend on any external factors. This happiness, I felt, was real. This was not one-off but happened over several occasions on several days in this section. Perhaps the nothingness around me reflected the reality – this is all there is, nothing! 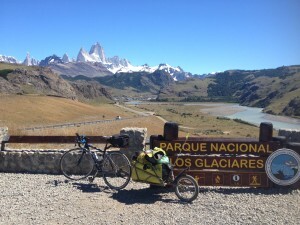 I was glad to have made the decision to cycle the Argentinian Patagonia. El Chalten, a famous town known for that special stone, rock climbers tease, was an 180 kms de tour from Routa 40. But I was keen to visit even though I have been here four years ago, for this was not an average garden stone, a mammoth rock that rises up to an altitude of about 3000 metres called Mt Fitzroy. I was able to see it from 90 kms away, quite a panoramic view which remained the same for 90 kms, a range of ice covered mountains, including some glaciers and Mt Fitzroy itself at the end of it. 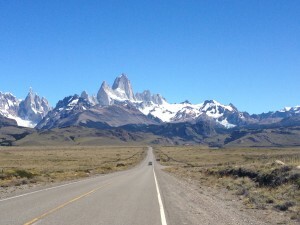 With clear blue skies it was an panaromic view to he had for about 4 hours all the way into El Chalten. I was glad I made this detour. The next day I hiked about 7 hours in total to watch Mt Fitzroy up close, for the second time in my life and the blisters that resulted was worth it. I was so lucky to have clear blue skies the whole time. From El Chalten it was two days ride to El Calafate where I am at the time of this writing. The night in between was spent at casa rosada (Pink House), an abandoned house that has been appropriated by touring cyclists. 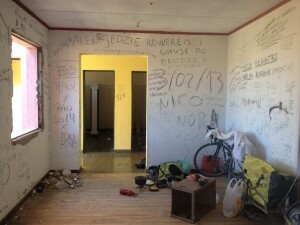 The walls were littered with signatures of cyclists, hundreds of them, whom used this place and some of them I recognised, an interesting social experiment I thought. 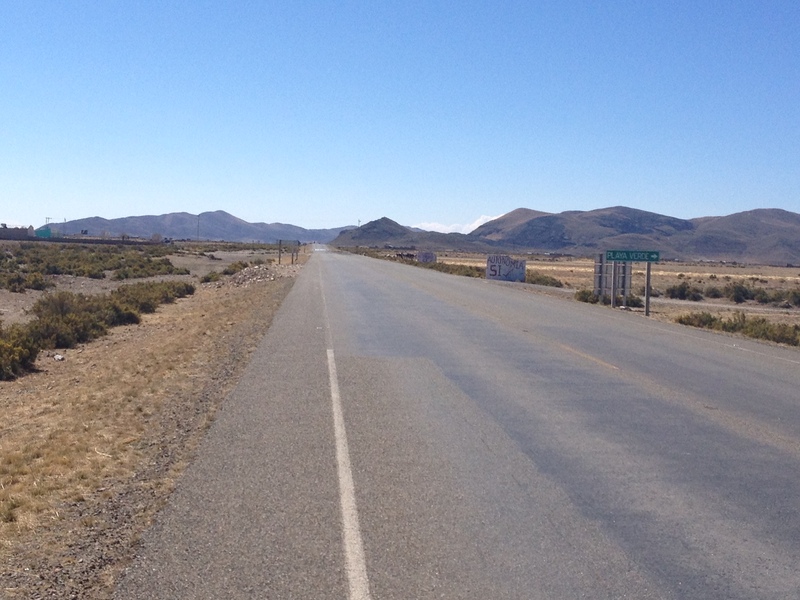 El Calafate welcomed me with some 30 kmph headwinds, well this is Patagonia after all! Bariloche to El Calafate (1620 kms of riding; route map): Bariloche – Rio Villegas (68) – El Bolson (52) – Leleque (73) – Esquel (90) – Futaleufu (60 kms by bus, 10 kms riding) – La Junta (60 kms to Villa Santa Lucia by bus, 30 kms riding and another 30 kms on a pick-up) – Puyuhuapi (47) – Villa Manihuales (60 kms by bus followed by 90 kms riding) – Coyhaique (90) – farm house at the turn off from Carratera Austral towards Puerta Ibanez (92) – Chile Chico (30 kms ride to Puerto Ibanzez and a ferry crossing) – Perito Moreno (73) – Bajo Caracoles (130) – Estancia La Sylvina (140) – Gobernador Gregores (91) – Estancia La Siberia (82) – Tres Lagos (90) – El Chalten (125) – Casa Rosada (120) – El Calafate (97). Some route notes: At Rio Villegas the football field is a nice place to camp there was a river, a school nearby with open wifi and a mini market across. In Leleque there was a police station on the side of the highway the only sign of civilisation in this section for about 140 kms up to Esquel. The pavement information on Carratera Austral found on crazyguyonabike site on this page (https://www.crazyguyonabike.com/doc/page/?o=tS&page_id=412915&v=Qm) was accurate as of January 2016. 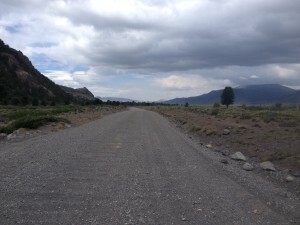 The road between La Junta and Villa Santa Lucia was being paved when I passed through. Cyclists will note that, in general, the gravel roads were worst when construction work is in progress. 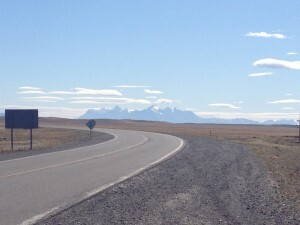 On the route 40 between Perito Moreno and El Calafate except for a 70 kms section the remaining were all paved. The construction work in this section seemed to have been abandoned half way through. 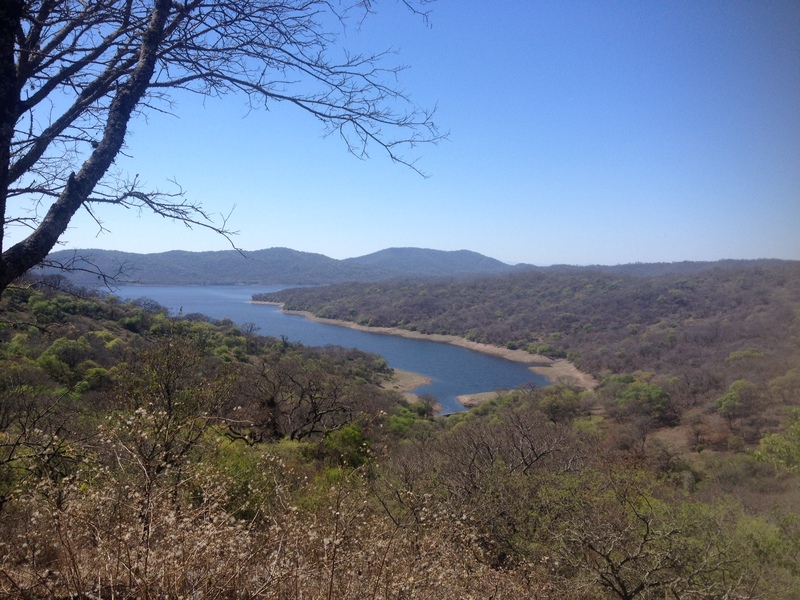 Water source on route 40 was very scarce and on some days there were none, be prepared! 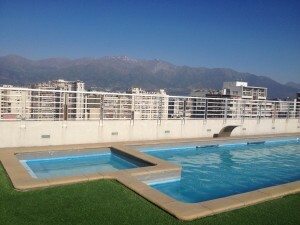 My time in Santiago flew by and I could have easily stayed there longer. It was time to leave because things became too familiar and it was not the time to return to ‘normal’ life. I really liked this place though. 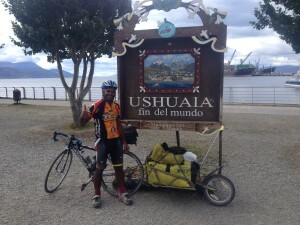 I had originally planned a six days ride to Concepcion another big city in the south of Chile on the Pacific coast. It was a bit of an underestimation. Even though there were no big mountains the rolling hills landscape, reminiscent of the South West of England, had lots of roller coaster roads. I had to extend my journey by a day to cope up with the hills. 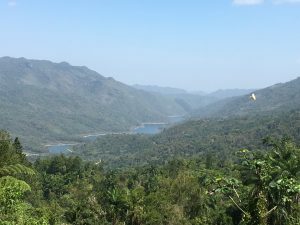 The first two days were relatively easy although I was numb to my surroundings since my mind was pre-occupied heavily with the floods in Chennai and my inability to contact my mother for few days. If this floods had happened a few years ago it would have been a devastation for us. For instance one of our neighbours who still owns cattle lost all their animals, 15 of them, to the flood and also their house went under water for few days and they were left with not even change of clothes. My mother had to be rescued and her house was under water too but luckily I am in a position where I can help my mother to recover some of the things she lost. At the time of climate conference It is almost impossible not to link these extreme events to climate change even for a rational scientific minded. It is a pity that science is not sophisticated enough, yet, to find the links or otherwise. Nevertheless I believed it is better to err on the side of caution. 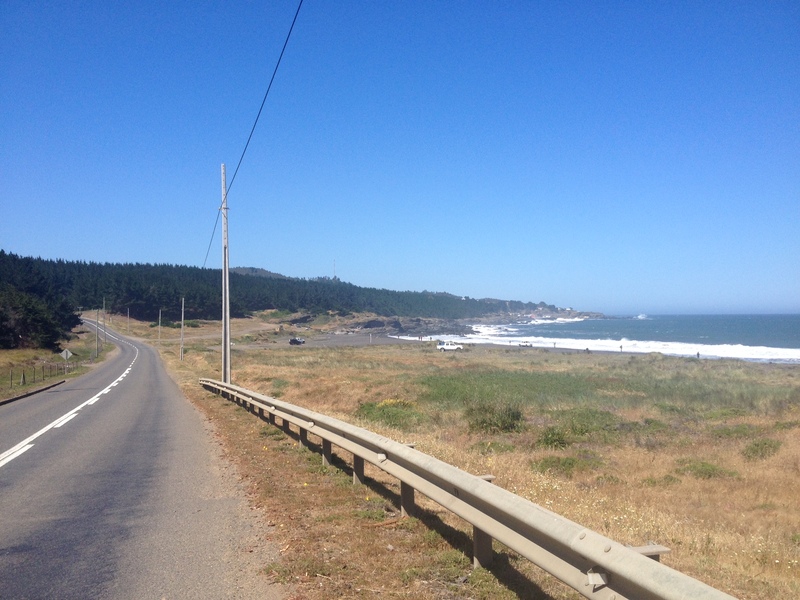 With all this in my mind it was hard to ignore the amount of logging I noticed and the annoying extra long trucks that would swerve around me during my ride in the coastal areas of Chile. Without knowing the hard facts judging these as deforestation would be based solely on emotion. For instance we don’t feel the same emotions when we see piles of paper. However my sincere hope was that these trees were chopped with all due considerations for the environment. Fire stations in Chile were abundant.Almost every small village had one and they were very friendly. For cyclists a safe place to roll over the mattress was all needed but the bomberos (fire station) in Chile also had hot water for shower and even wifi, at least most of the ones I went did. 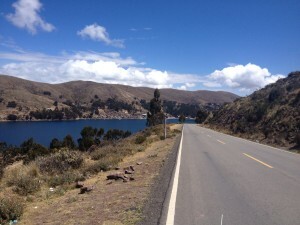 I was looking forward for my ride on the coast since it had been a long time, ever since I left Colombia, since I cycled along the Pacific coast. When I arrived in Concepcion it was great to see some familiar faces; Deborah and Woody whom I knew from my time in Plymouth hosted me kindly for 5 nights. We had some English tea, curries, some grey skies and even a rainy day. Combine this with the rolling hills landscape and rugged coastline it was almost like being back in Devon for few days. After Concepcion I wanted to try and avoid the coast because it was too hilly and windy. 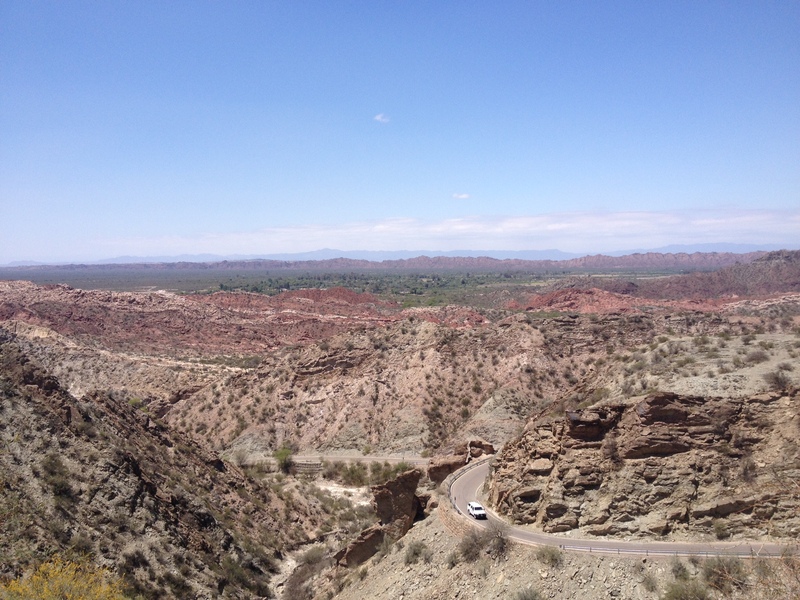 But the road I took to get back to the Andes mountains was no less difficult. For instance on one of the days the total ascent was about 1200 metres even though my net altitude gain was zero. I would rather climb a mountain than these rolling hills. On top of this I made a silly mistake. Assumption. A yellow line on google maps was not a good enough indicator for pavement. After leaving Nueva Imperial I hit a gravel road. The town where I wanted to go was about 30 kms away. The loose gravel was slippery and I had to be on my feet. There was no way I could have navigated my way from my saddle. The chances of rescue were remote since no vehicles passed by. I was preparing for a really bad day and was even ready to spend the night somewhere on the road. About 10kms into the road there were few houses and one of them was inhabited. I restocked some water and they gave me a good news. The last 10 kms of the road were paved; a slimmer of hope began. Eventually I hit the pavement and I was flying. All the spent up anger I suppose. I still had 60 kms to my planned destination and all of it was on paved roads which was a piece of cake compared to my experience earlier the day. 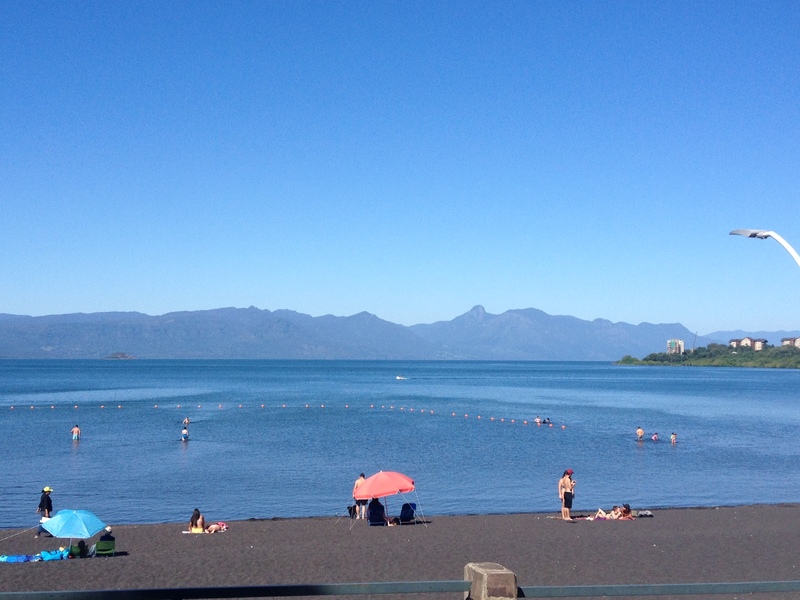 I arrived in Villarica a very famous tourist destination that has some resemblance to lake Geneva. 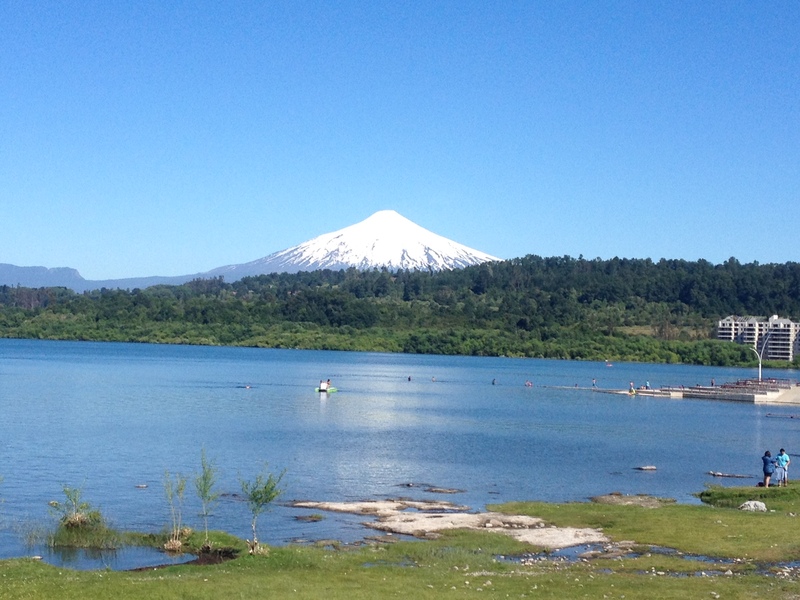 A beautiful mountain line on one side of the lake and an ice covered volcano on the other side. 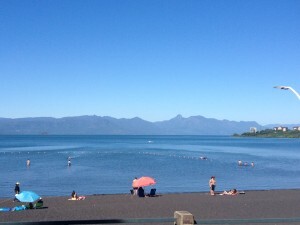 The beach on the lake was teeming with holiday makers on that sunny evening with cooler breeze. It was a fantastic treat for all the hard work earlier the day. 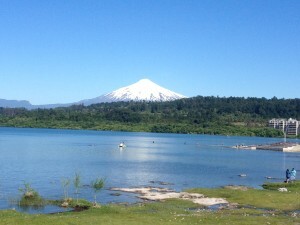 After Villarica the road skirted around the lake to Pukon another popular holiday destination after which the traffic died and the road went through some dense forest on the mountains with plenty of waterfalls on the side of the road, all thanks to the glacier on the volcano. I stopped in the last village before the border called Currerihue a lovely small place nested in the mountains with some stunning views. From this village it was 40 kms to the border including 15 kms of climb with some steep sections. The border crossing was just a formal rubber stamping process. 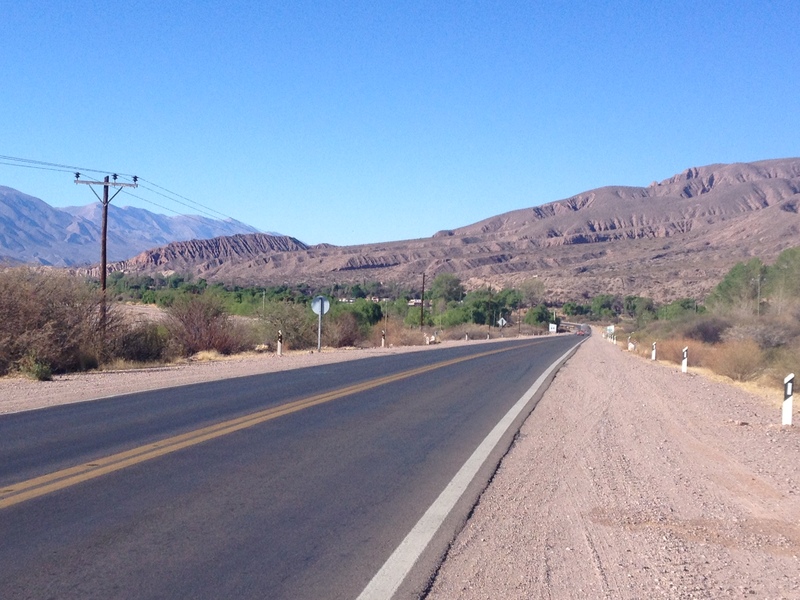 Another surprise awaited me at the border, a 14 kms gravel road on the Argentinian side. This time it was a gentle downhill and the winds were on my back. None of these helped. The tyre marks by the passing cars added to the already bumpy ride and the dust wave generated by the passing cars was a nuisance. I managed to stay on my saddle and rolled over the gravel at 8kmph mostly. It was impossible to ride the curves since my front wheel started to slip whenever I tried to turn. It was safer to get off and push the bike instead. After 14 kms I hit the pavement and the next 50 kms I rode at an average of 30 kmph largely thanks to the tailwinds and gentle negative gradient. It was a joy. 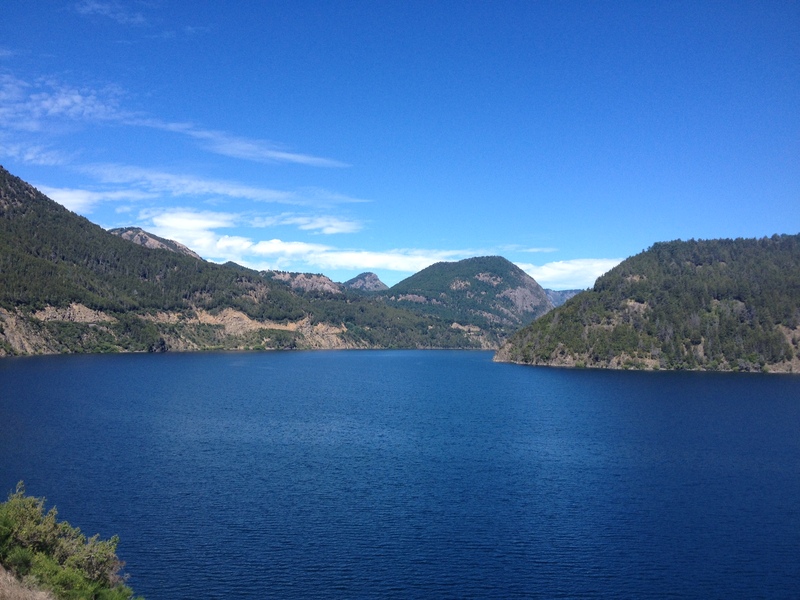 The dense forest with lots of water on the Chilean side of the Andes was in shark contrast to the drier and more expansive landscape on the Argentinian side. I eventually reached Junin de Los Andes. From here onwards I was on some of the most popular holidays destinations in Argentina: The Lake District. 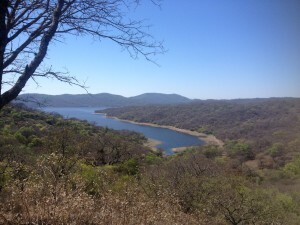 As the name says it was full of lakes surrounded by mountains. 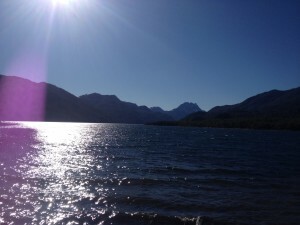 I was invited to spend Christmas with Harry and his family in San Martin de Los Andes. 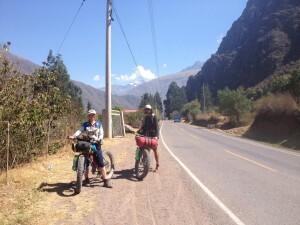 Harry and his wife have pedalled the length of Americas and also Harry had climbed all the 7 summits in each continent. It was great to exchange lots of stories and spend some good time with his family. I really enjoyed the company of their kids Julian and Tommy. The cheeky fella Tommy, who was only just beginning to talk, found it too easy to pronounce my name. It was only one of the handful of words he had learnt so far and I hope he will remember it. We had curries for Christmas Eve and lots of sweets which went until midnight. I left San Martin de Los on Christmas Day since the weather was great, almost zero traffic and the leaves on the trees were still. A perfect combination for an excellent ride. I rode 50 kms along the famous 7 lakes route and camped next to a lake. I will let some of the photos do the talking about the stunning scenery and clear blue skies I had. Waking up to the views of a big lake with some mountains on its backdrop was not a daily routine and was enjoyed thoroughly too. The ride on the Boxing Day was also on identical conditions and again, yet another wild camping next to a lake. 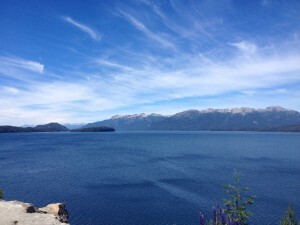 The final day was a relatively easy ride into Bariloche – the ‘queen’ of the Andean lakes district. 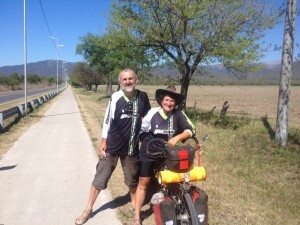 The route (1419 kms): Santiago – Rancagua (91) – Santa Cruz (99) – Hualane (90) – Constitution (84) – Chanco (62) – Quirihue (94) – Concepcion (90)- Nacimiento (108) – Traiguen (115) – Nueva Imperial (67) – Villarica (106) – Curerrehue (63) – Junin de Los Andes (110) – San Martin de Los Andes (48) – Lago Villarino (50) – wild camp (99) – Bariloche (43). The road between Nueva Imperial and Quepe is a very bad gravel road. 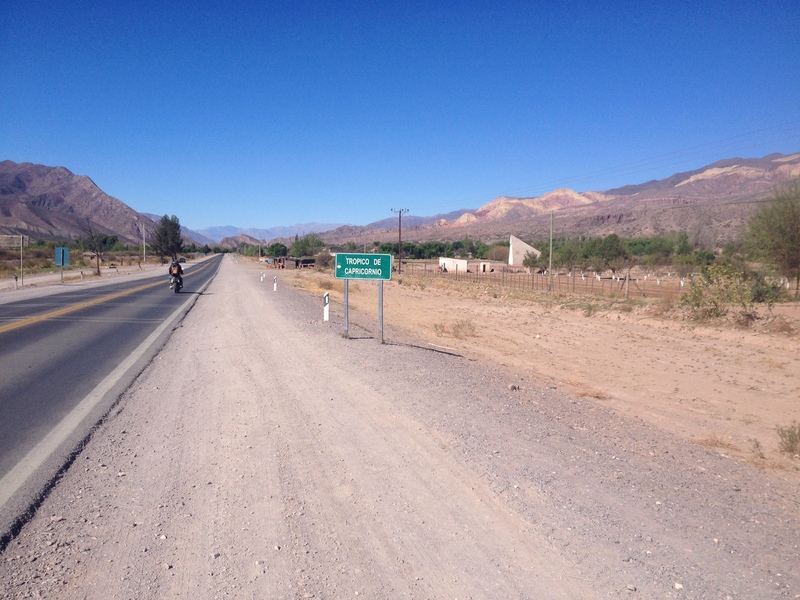 The road from the Paso Hamuil Malal about 14 kms from the border, on the Argentinian side was unpaved although rideable. This would be the last big pass in this trip about 3200m high. I will be going over some passes further south but none of them above 1500m. 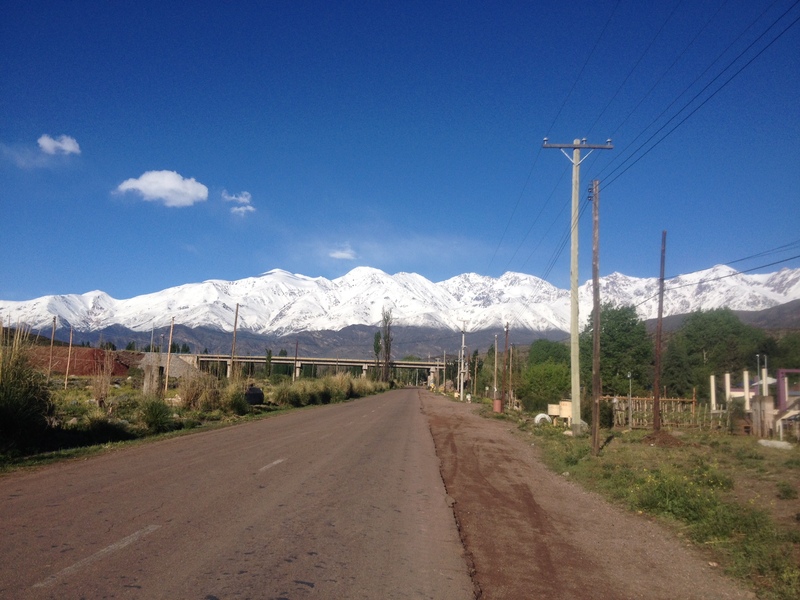 Leaving Mendoza was straightforward I just had to head towards the mountain. The highway was pretty busy and after the turn off the road became narrow with just two lanes and the white paint was right at the edge of the road. At one point a truck crossed me too close almost airtight. Never in this trip I had such a close encounter; all I could do was finger gesture hoping the driver noticed my greeting in his rear view mirror. But the traffic died when I got closer to the mountains. The mountains were covered in snow courtesy of the wet weather the previous few days. I was planning to do this pass over three days but extended it by one more day. 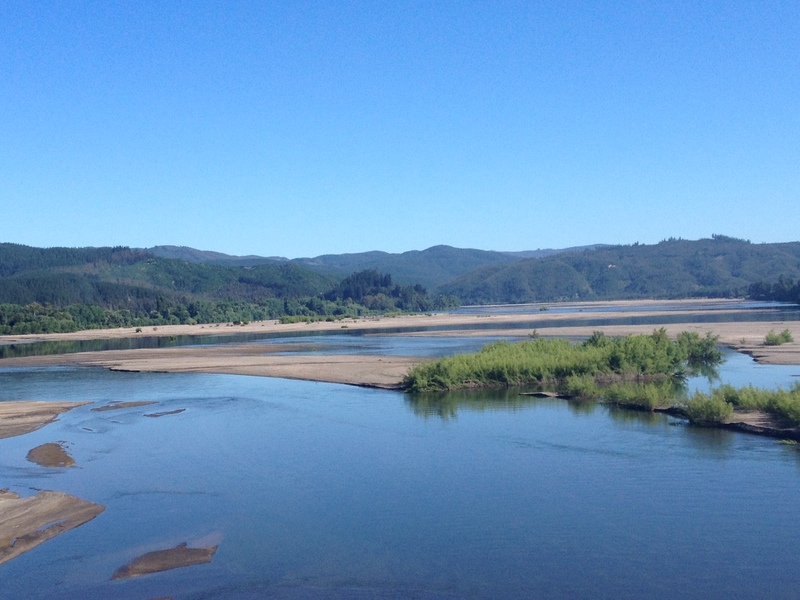 It was simply too pretty to not spend more days here and also there were plenty of beautiful campsites. 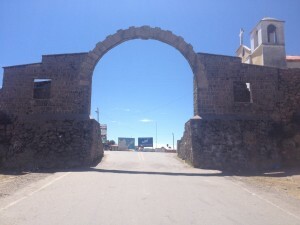 The Argentinians were quite organised when it came to holiday places. 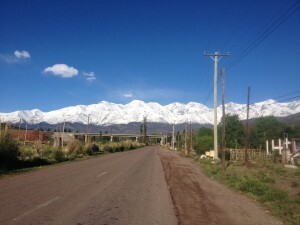 The first day I camped in a place called Potrerillos and the second day was at Uspallata, a popular ski place, where there was another wooded campsite with the view of snow covered mountains all around. 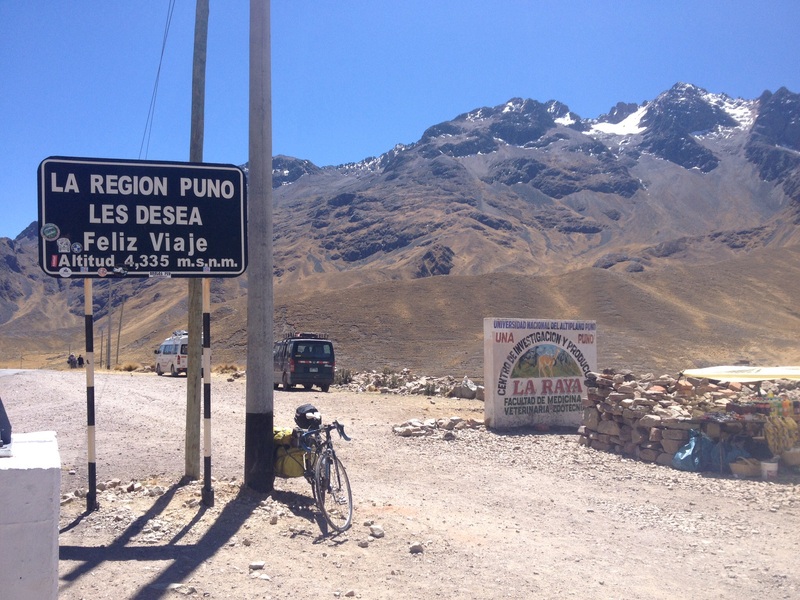 From Uspallata to Puenta del Inca at 2800m was about 70 kms and a decent climb. The wind was ferocious but the views made up for it. By the time I arrived I was engulfed in a passing storm although it did not deter me from camping. 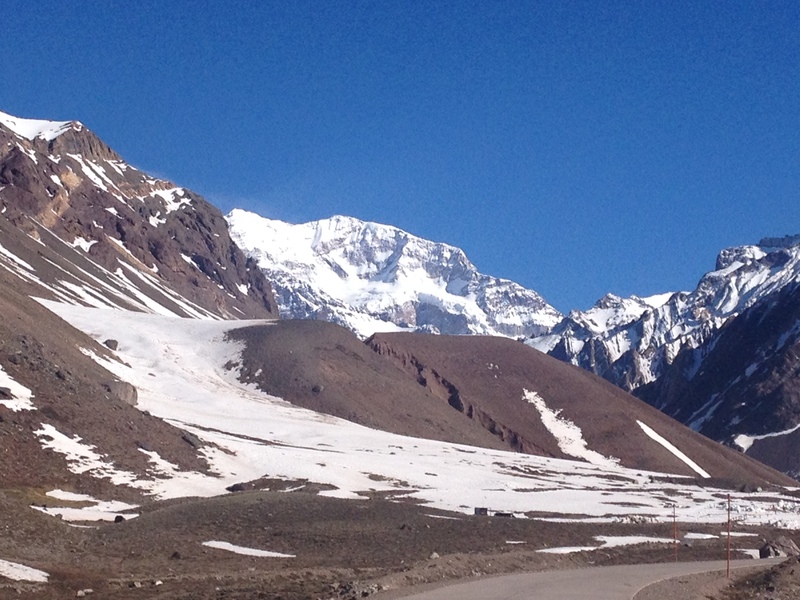 I had been here before during my previous visit to climb Aconcagua a legendary tall mountain about 6986m high. I never thought I would be returning here on my bicycle. Just over two kms from Punta del Inca was the Aconcagua park entry from where the climb to Aconcagua begins. 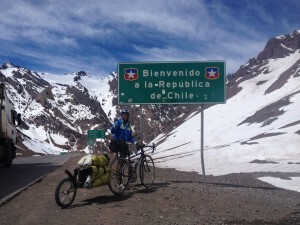 A short video of riding my bike with Aconcagua as the backdrop was irresistible although it sounded a bit cheesy. The next 12 kms to the tunnel at the top of the pass was again a bit of a climb and the snow was right on the side of the road at touching distance all the way. It felt like an alpine ride in winter. Some of the most joyous and satisfying moments were to be had over these four days. Another dream became reality and the happiness/satisfaction that resulted was immeasurable. 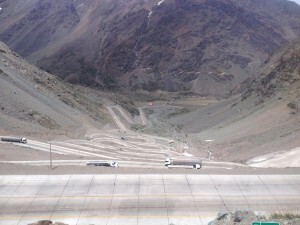 Cyclists are not allowed in the tunnel that separates Argentina and Chile, at the top of this pass but the company that manages this tunnel ferries the cyclist across at no extra cost. On the other side of the tunnel was the Chilean immigration which I found super-efficient considering the amount of people using this road. The next 60 kms was descent all the way including a spectacular sight of 25 numbered hair-pin bends that was more like a neatly laid out sphagetti. It was an awesome sight so much so that even trukkers stopped to take photos. 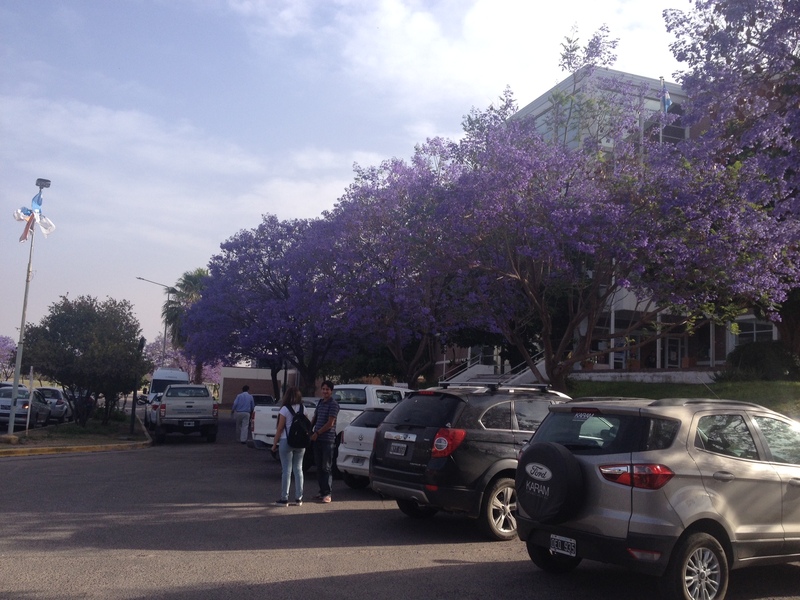 I descended into Los Andes where I stayed at the Bomberos (fire station). 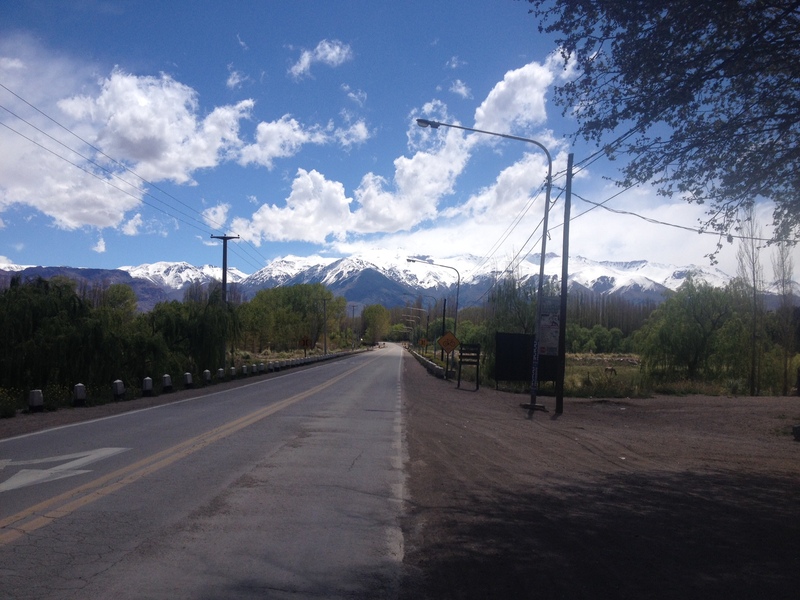 From Los Andes it was a 70 kms ride into Santiago. I have been in contact with Sebastian a chemical engineering student at the University of Santiago whom I knew through the good Samaritans of the San Juan University in Argentina. 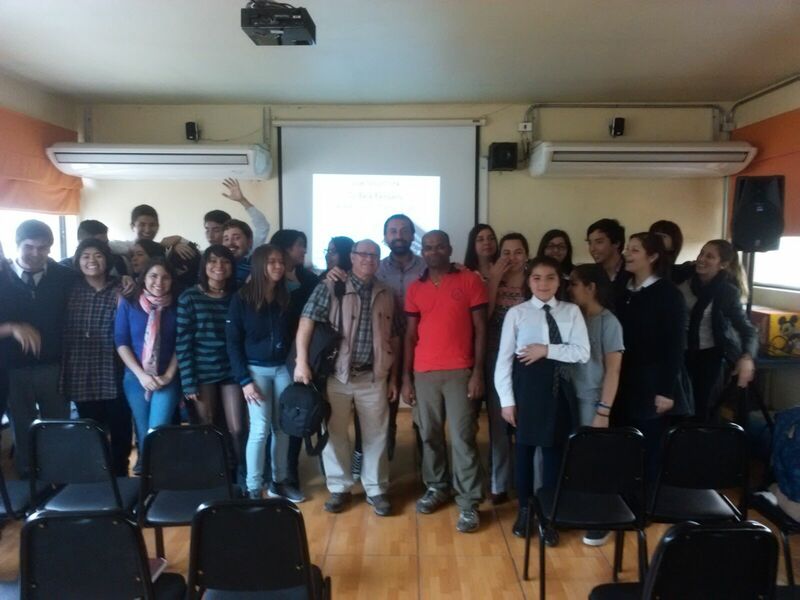 Sebastian was the President of the Chilean Chemical Engineering Students Association. He had organised four different talks for me one each at University of Santiago, University of Chile, University of Santa Maria and a secondary school. Several of my audiences shared my interests and it was a great pleasure to talk in details about the motivation behind this trip and also my experiences. 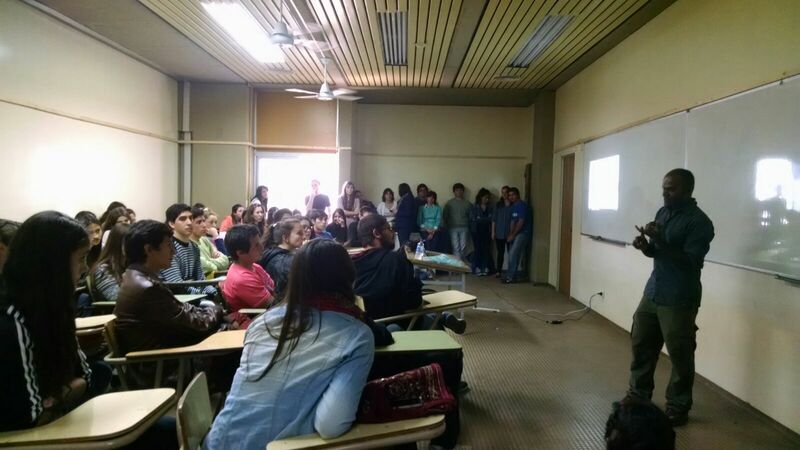 The University of Santiago has invited me to give a technical talk on my research work where I plan to use some of the teaching skills to have an engaging and interactive session which will be the first time I do this at University level. I would like to thank Sebastian for his time. It was great to meet him and some of his friends. 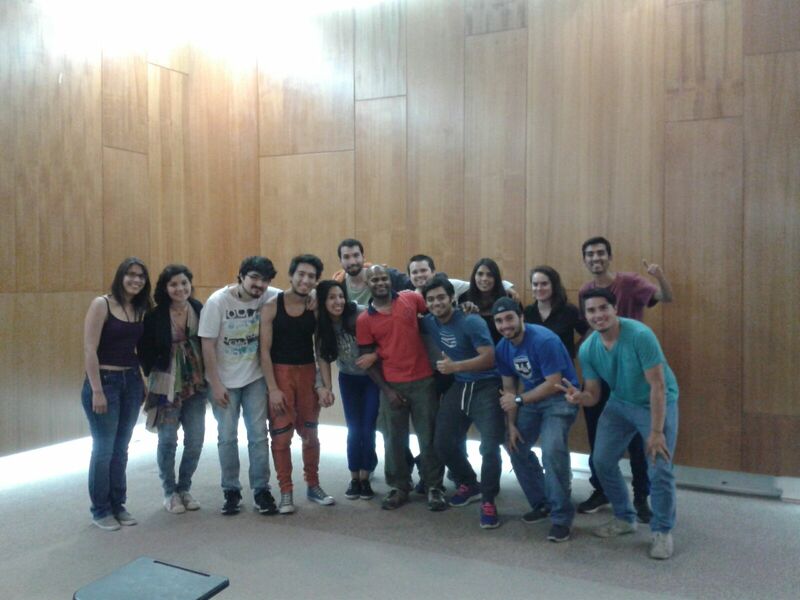 I felt like I have made some good friends and also know Santiago. 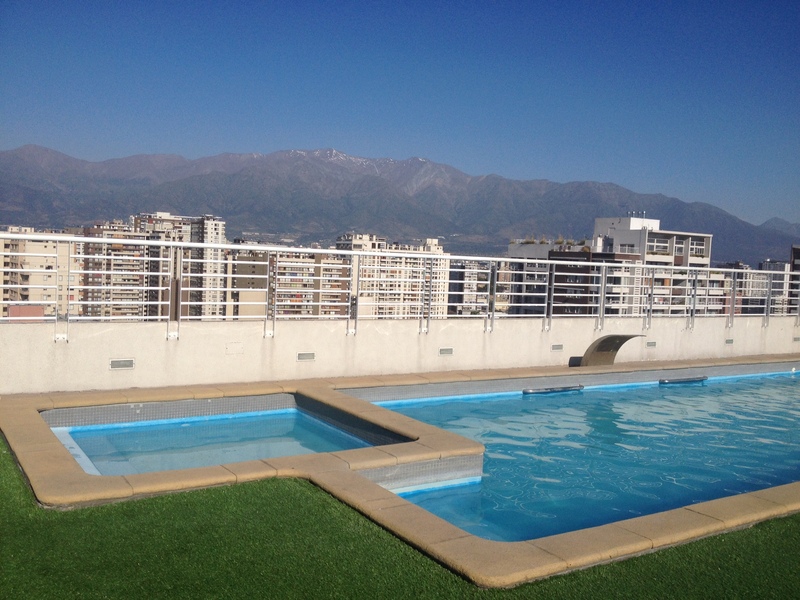 My host in Santiago where I have been staying for the last two weeks, Carlos whom I met through airbnb is another friendly soul. He is planning for a bicycle trip around the world and has been buying gear over the last two weeks. I share his excitement and wish him well. 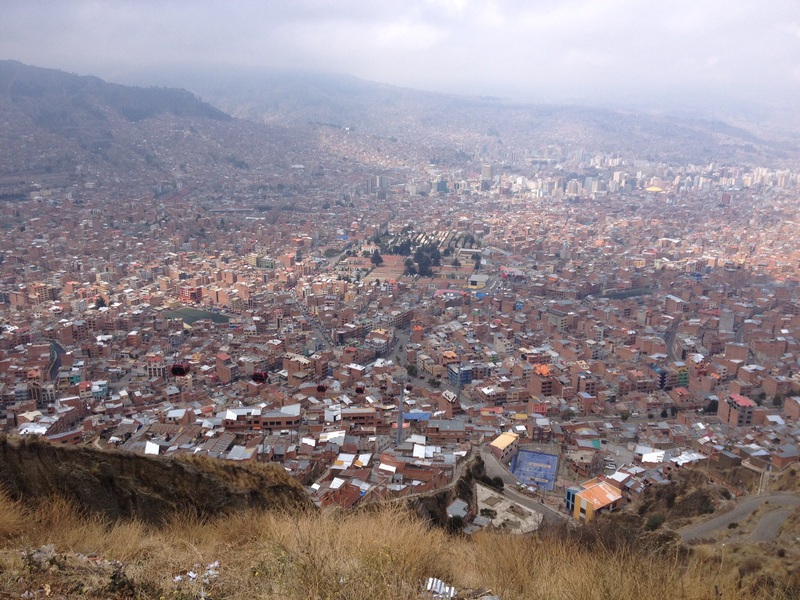 The city of La Paz was almost the shape of a bowl, the side wall was about 350 meters in height and was packed with houses. 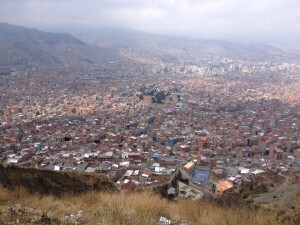 The cable car that runs up and down was the quickest way of getting to the top part called El Alto. Unfortunately bikes can’t be transported in the cable car. So, I chose a steep road, about 3 kilometres, to do this climb to avoid the 15 Km’s busy highway. The gradients were more than 25% in some sections where I expected to push my bike. It took more than 75 minutes to do this climb. 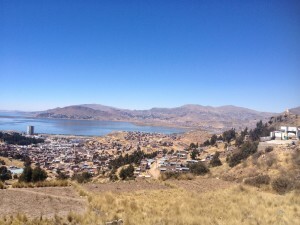 I had to stop almost every 50m since the altitude made me gasp for air. I was not embarrassed to ask for some help from people on the side of the road to help push my bike up. It was a mean task. In retrospect it was silly to try push a loaded trailer on this vertical road especially at these altitudes – The worst climb I have ever done. Once I was at the top at El Alto, the road was flat for the rest of the day. I rode for 96 kms to end the day at a small town called Patacamaya. 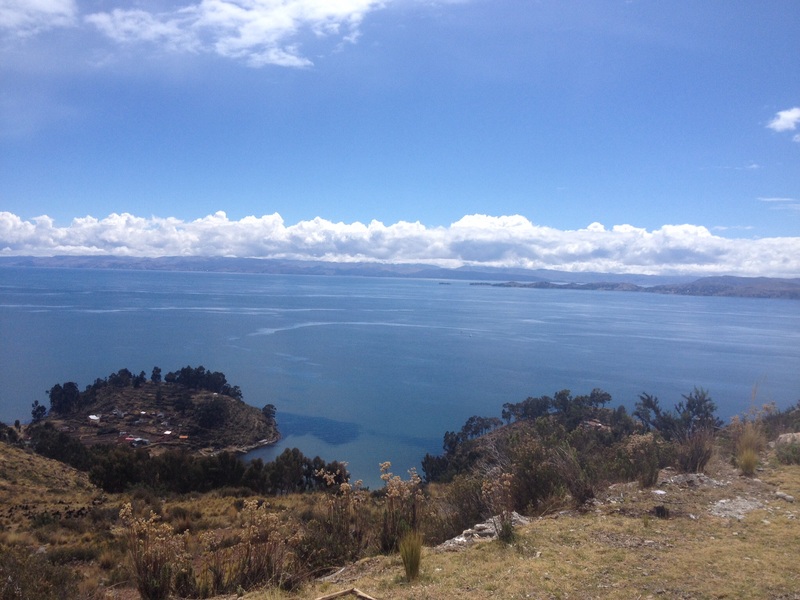 As long as the sun was out and the wind was calm Bolivian altiplano can be navigated with relative ease. I decided to do some long distances the following two days. 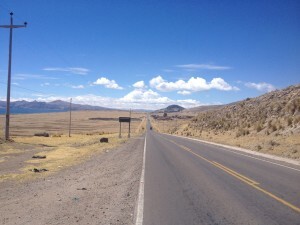 It was 126 Km’s to Oruro and the highway had two lanes (two on either side!) and even a shoulder lane. All the exits and entries to the highway were signposted too. This section of the highway would pass the international standards. But there were no cars, absolutely none whatsoever, on the day I rode. 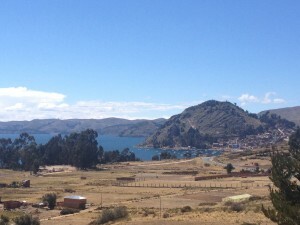 I realised later, in Bolivia, roads and shops shut during election day even if it’s provincial elections. 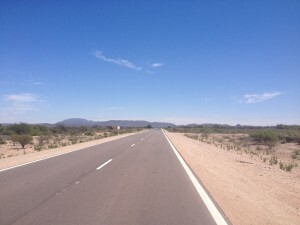 I had the entire highway to myself and it was a great ride. 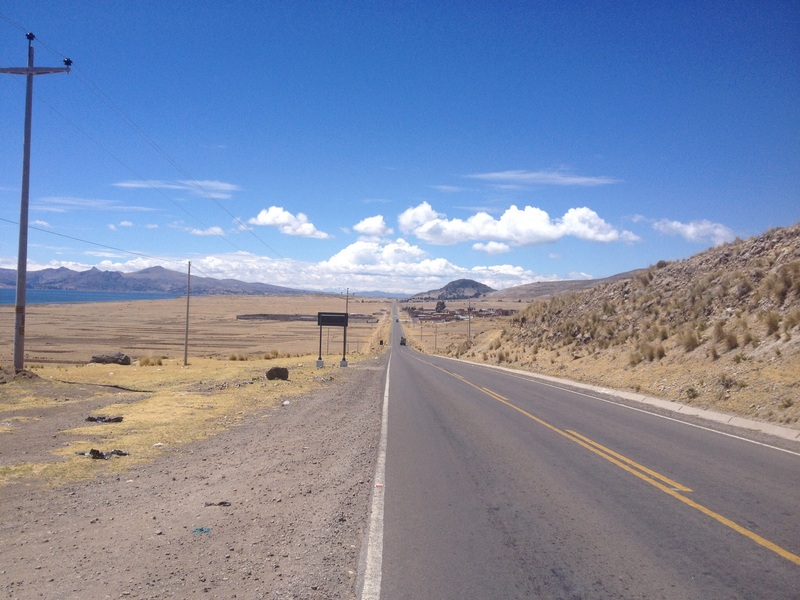 After Oruro the highway returned to local standards. Luckily the traffic was very minimal and so the next 120 Km’s ride to Challapata went smooth too. The rhyming names of some of the towns along the way provided for brief entertainment, Sica Sica, Ayo Ayo, Cala Cala, Vila Vila and the best one was Poopo. In Challapata I met a local cyclist who gave me the news that I didn’t like to hear – some 20 Km’s after Challapata the road to Uyuni was dirt. The alternative was a long loop around Potosi which would mean staying at higher altitudes for some more days. The sun at this altitude was vicious and burnt the skin badly including the skin over my cheek bones on my face and nose. I realised why people wear hats in these areas. 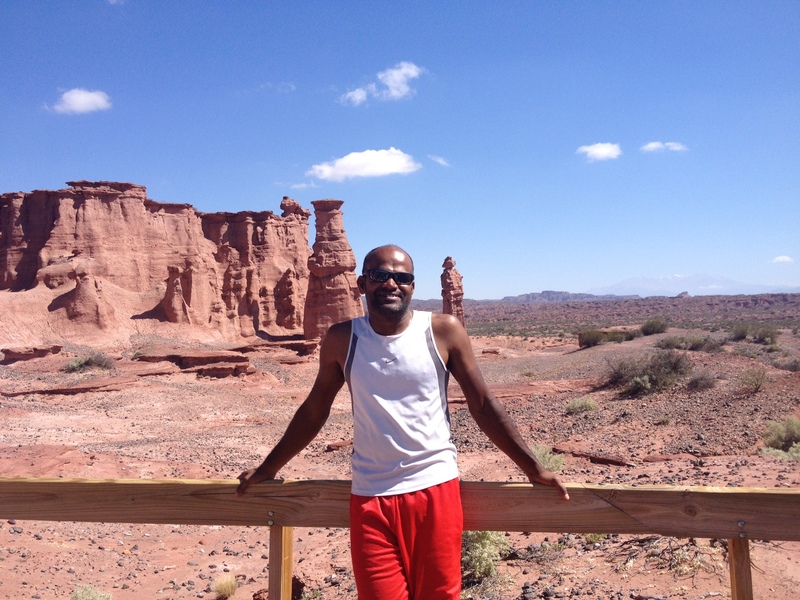 Also, I was getting tired of staying in cold places and that too with no hot showers. I decided to take the train from Challapata to Colchani about 180 Km’s. I had to wait two days for my next train since there were only two trains per week. Challapata had nothing to offer for tourists, just a dusty town in the altiplano. But of course there are always schools! I found a school for my motivational talk which went very well. 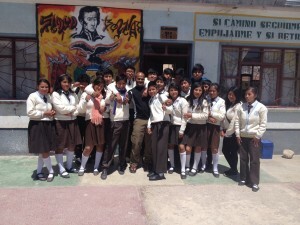 The children’s desire for economic development was obvious when I showed them photos of my trip from USA and Canada. They were amazed by some of the pictures of Vancouver and Seattle, the big cities with skyscrapers. The train had a special box for cargo where my bike was thrown into. The ‘popular class’ was the only option for people who board the train at small towns. Indeed it was cheaper but was packed like a cattle truck. I arrived in Colchani at 1.30am after a four hour sleepless journey. 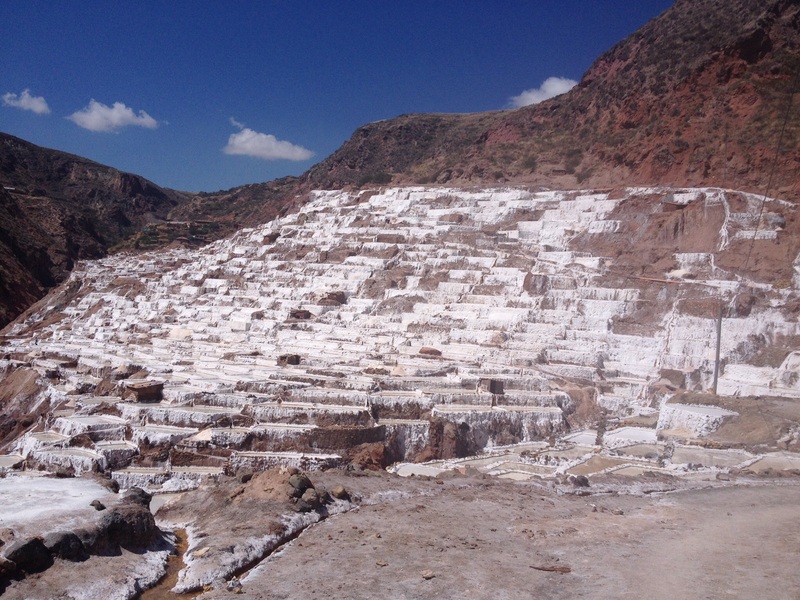 I was hoping for a hospedaje (cheaper accommodation) in this town because this town was right at the edge of the Salar – the largest salt plains in the world. I went around this town for an hour looking for the only hospedaje that was not sign posted. It was freezing cold and dogs were barking mad. 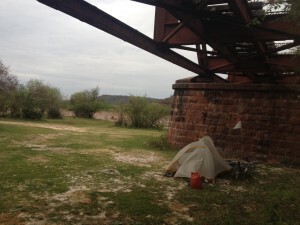 I gave up after a while and decided to pitch my tent on the side of the road. I tried to kill the next few hours trying to sleep but was not successful. 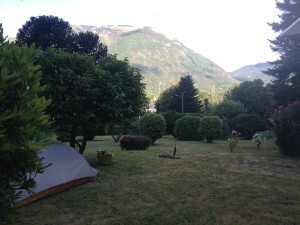 The sun went right through my tent at 6.30am – some warmth at least. 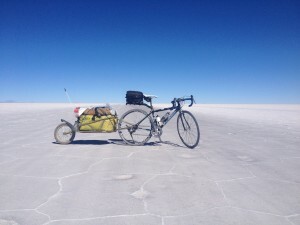 I packed up my tent and started riding towards the infamous Salar. The salt plains in Bolivia was world famous and one of the main attractions for touring cyclists in Bolivia. It was in front of me, the vast reserves of salt, the expansive view with the salt meeting the blue sky at the horizon. 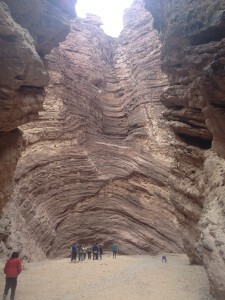 Internet has lots of photos of people doing all sorts of acrobatics and photoshoot in Salar. Even a random click with a camera phone resulted in some fantastic photos of my bike here. 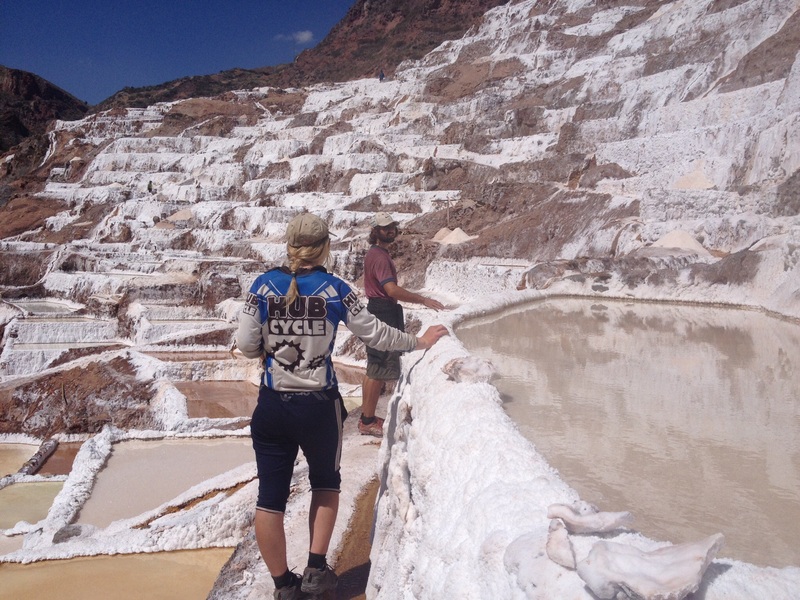 I rode for about 26 km’s over the salt which was just sufficient to experience riding over the salt. 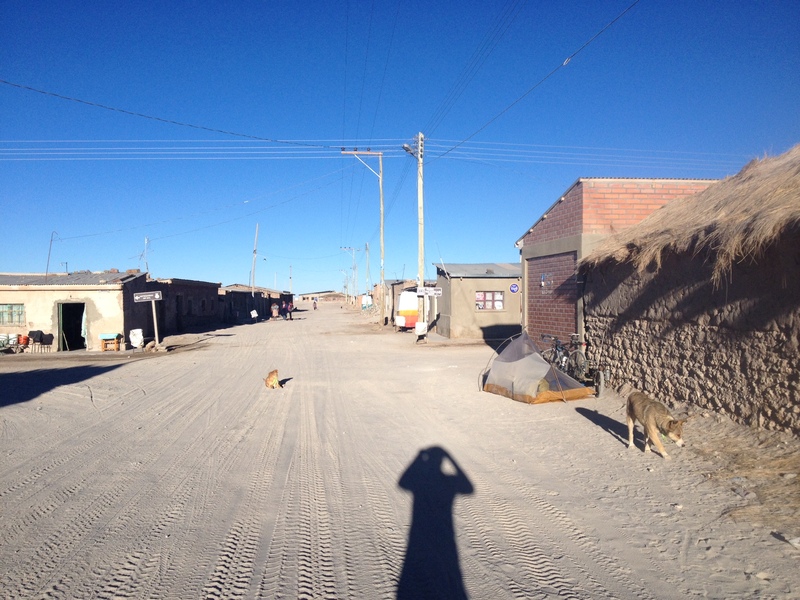 From the Salar I rode to Uyuni from where I had to take another train to Villazon, the town at the Bolivia-Argentina border. 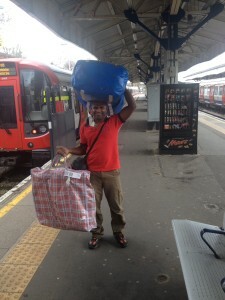 This overnight train journey went fine and I arrived at the border around 7 am. The border formality took much longer because of a long queue. 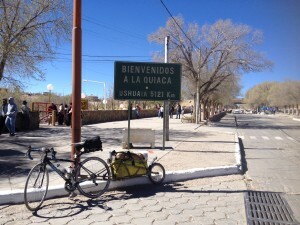 Around 9 am, I crossed the border and started riding in Argentina. 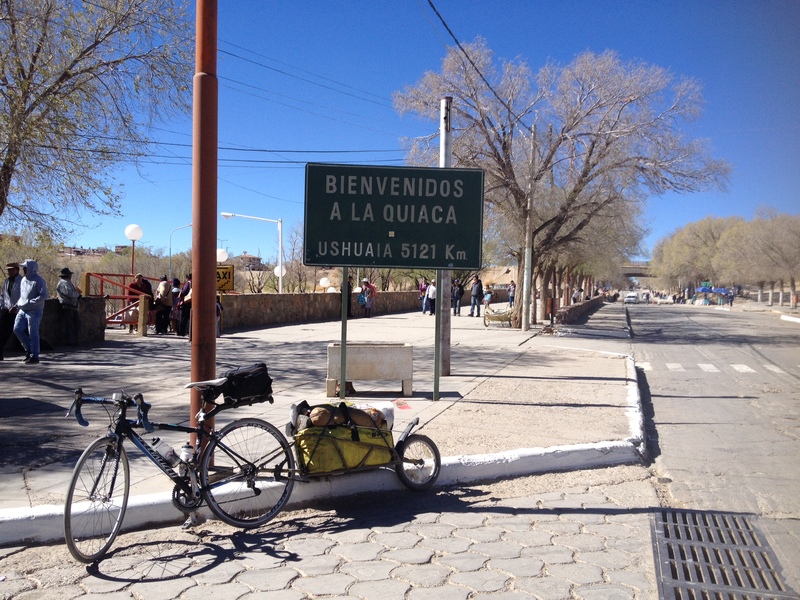 The altiplano continued for another 80 Km’s or so. I was excited to be riding in Argentina since I was going to be at much lower altitudes soon and the warm weather that goes with it. After about 8 Km’s I stopped to take a small break. There was nothing to lean my bike against so I had use my kick stand instead. The wind crashed my bike and when I started riding again the chain was not flowing smooth. I changed my gears to diagnose the problem. The derailleur hanger snapped and the derailleur got trapped within the spokes and the bike came to a halt. Even the chain got bent irreversibly. I had to walk back to the border town to catch a bus to Humahuaca where I found an excellent mechanic to get things sorted. Luckily I had a spare derailleur, the hanger for the same and even a spare chain. 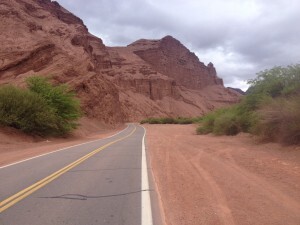 The ride from Humahuaca to Jujuy was mostly downhill from 3000m to about 1200m and about 129 Km’s. The altiplano gave way to valleys with some greenery. It was a welcome change to see some trees and tree-lined streets. Jujuy to Salta was an excellent ride via some curvy narrow roads in the mountains along some lakes. The weather in Salta where I am at the time of this writing is fantastic. I walk around with shorts and sandals even in the night time!